Trains from Munich . . .
Click here for journeys starting in another city. 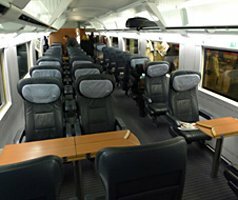 This page explains how to travel by train from Munich to other European cities and how to buy tickets the cheapest way. Train information is current for 2019. Tip: With a 1st class ticket you can use the DB 1st class lounge. Tip: For a beer or local Bavarian food before your train try www.augustinerkeller.de at Arnulfstrasse 52, on the north side of Munich Hbf. Take a moment to read these tips for buying European train tickets. They answer all the usual questions, "Do I need to book in advance or can I just buy at the station? ", "Can I stop off? ", "Are there Senior fares?" and that old favourite, "Should I buy an $800 railpass or just buy a €35 point-to-point ticket online?". Click here to understand how far ahead you can buy train tickets. There really is no excuse for flying this route! From 10 December 2017 when a new section of high-speed line opens, Munich Hbf to Berlin Hbf takes as little as 3h58, city centre to city centre by luxurious ICE train with zero check-in to add. From city to city it's as fast as flying but less hassle, more comfortable and more civilised. 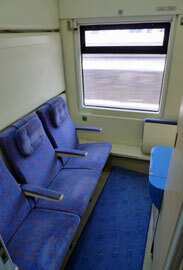 The ICE train have power sockets at all seats, a bistro-restaurant car and some have WiFi. Fares start at €29.90 in 2nd class or €59.90 in 1st class if you pre-book. The flexpreis is around €130 if you buy on the day, 2nd class. Buy tickets at www.bahn.de and print your own ticket or simply show it on your smartphone or laptop screen. Booking now opens up to 180 days ahead, though much less when the mid-June or mid-December timetable change is in the offing. 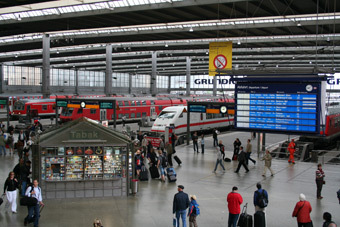 Munich Hauptbahnhof is the main station right in the city centre, and all mainline trains leave from there. With only one or two exceptions, German trains are never reservation compulsory so you can always just turn up, buy a ticket and get on the next train without a reservation. However, if you do that you'll pay the highest-priced full-flex flexpreis. If you pre-book there are much cheaper sparpreis fares for €19.90, €29.90, €39.90 etc. for long-distance journeys, so buy in advance if you want to save money. Booking now opens up to 180 days ahead, though much less when the mid-June or mid-December timetable change is in the offing. www.bahn.de will book all German long-distance daytime trains and the Nightjet sleeper trains from Munich to Hamburg, Cologne & Dusseldorf. A seat reservation is usually optional, for a small extra charge. You print your own ticket or simply show it on your smartphone or laptop screen. Alternatively, tickets can be sent to any address worldwide for a small additional fee. I recommend registering when prompted, rather than booking as a guest, so you can always log in and check or re-print all your bookings. Bahn.de is easy to use, and should have no problem accepting overseas credit cards. I recommend registering when prompted, as you can then log into your account at at any time and check bookings or re-print tickets. If you do encounter any problems with bahn.de you can also buy German train tickets at exactly the same prices with the same print-at-home tickets and the same lack of any booking fee at either www.loco2.com or www.trainline.eu both of which have implemented a direct connection to DB's ticketing system - although neither site can do sleeper trains. See the train travel in Germany page for a beginner's guide to train travel in Germany, including how to buy tickets online or by phone and an explanation of the Schönes-Wochenende-Ticket and Lander tickets. See the London to Germany page for full details of the recommended routes, trains, fares & how to buy tickets. The German railways website www.bahn.de can sell Sparpreis London tickets from Munich to London from €59.90 in 2nd class or €109.90 in 1st class, you simply print out your own ticket. Availability is limited as DB only has a small quota on Eurostar. If you don't see any attractive prices, split the journey and book Munich to Brussels at www.bahn.de from €39.90, then Brussels to London at www.eurostar.com from £44, making remembering to allow for the 30 minute Eurostar check-in at Brussels. An excellent direct TGV Duplex links Munich Hbf with Paris Gare de l'Est once a day leaving at 06:46 (06:23 on Sundays) and arriving Paris Gare de l'Est at 12:33 (12:05 on Sundays). The train has a cafe-bar and all seats have power sockets. It uses the TGV-Est high-speed line across France at up to 200 mph. I recommend an upstairs seat for the best views, any seat number above 60 is upper deck. Munich Hbf depart 08:28, change at Stuttgart, Paris Gare de l'Est arrive 14:05. Munich Hbf depart 10:28, change at Mannheim, Paris Gare de l'Est arrive 16:51. Munich Hbf depart 12:28, change at Stuttgart, Paris Gare de l'Est arrive 18:05. Munich Hbf depart 14:28, change at Mannheim, Paris Gare de l'Est arrive 20:05. Munich Hbf depart 16:28, change at Stuttgart, Paris Gare de l'Est arrive 22:05. All these departures use a superb ICE with bistro-restaurant car from Munich, changing onto either another ICE or an impressive TGV Duplex with cafe-bar for Paris. All trains are air-conditioned and all seats have power sockets. On TGV Duplex the best seats are upstairs, which is any seat number greater than 60. Fares start at €39 in 2nd class or €69 in 1st class. Prices are dynamic, so book ahead for the cheapest fares. Simply check times and buy tickets at the German Railways website www.bahn.de and print your own ticket or simply show it on your smartphone or laptop screen. I recommend registering when prompted, rather than booking as a guest, so you can always log in and check or re-print all your bookings. 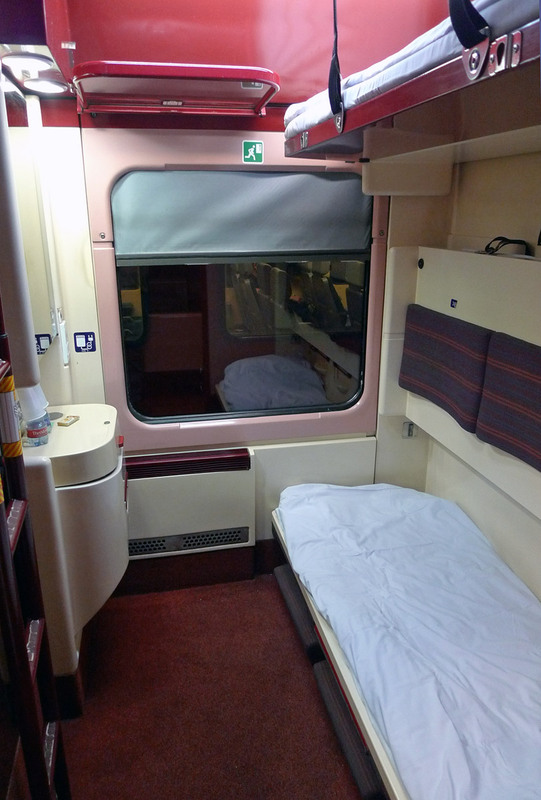 The Munich-Paris City Night Line sleeper train was sadly discontinued in December 2014. 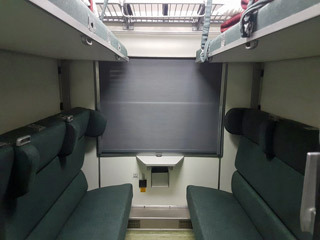 2nd class seats on upper deck. There's a mix or tables for 4 and unidirectional seating. 360º photo. 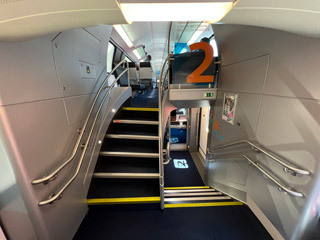 1st class seats on upper deck, a club duo on the left, club quatre on the right. 360º photo. Munich to Nice, Cannes, Monte Carlo, Marseille, Avignon.. Step 1, travel from Munich to Milan by Nightjet sleeper train leaving Munich Hbf every day at 20:10 and arriving Milan Centrale at 09:12. Book at German Railways www.bahn.de and print your own ticket. Step 2, travel from Milan to Monte Carlo & Nice by comfortable Thello train from just €15, leaving Milan Centrale at 11:10 arriving Nice Ville at 16:00. Buy tickets for this train at either www.loco2.com or www.trenitalia.com. It's ticketless, you just quite the booking reference on board. Note that on Trenitalia, Monte Carlo is listed as Monaco-Monte Carlo. Plain Monaco is Italian for Munich! It's a lovely scenic ride along the Italian Riviera between Genoa and Nice. Step 3, change in Nice for frequent trains to Cannes, Toulon & Marseille. Check times and buy tickets at www.trainline.eu. Day 1, travel from Munich to Verona from €39.90 in 2nd class or €69.90 in 1st class booked at either www.loco2.com or www.bahn.de. You can leave around 15:34 by comfortable EuroCity train through the wonderful Brenner Pass, arriving Verona Porta Nuova around 20:56, see the Brenner Pass scenery video here. All these trains have an elegant waiter-service restaurant car, so treat yourself to lunch or dinner as the mountains roll by! By all means take an earlier train for an afternoon or evening in Verona, for example the 09:34 or 11:34. Stay overnight in Verona. Hotels near the station with good or great reviews include the Corte Merighi Rooms & Breakfast, Novo Hotel Rossi, Guesthouse Verona or (a little closer to the centre but with fab reviews) the Relais Empire. Day 2, travel from Verona to Monte Carlo & Nice leaving Verona Porta Nuova around 09:32, one easy change in Milan's magnificent Centrale station onto an air-conditioned Thello train arriving Monte Carlo late afternoon and Nice Ville at 16:00. Book this from €24.90 at either www.loco2.com or www.trenitalia.com. It's ticketless, you just quote the reference on board. It's a lovely scenic ride along the Italian Riviera between Genoa and Nice, through Savona and San Remo. Change in Nice for Antibes or Cannes. Local trains link Nice with Antibes & Cannes every 30 minutes or so, just buy at the station in Nice and hop on the next train. Change in Nice for Marseille, Avignon, Montpellier, Perpignan. Allowing at least 45 minutes between trains in Nice book an onward ticket at either www.loco2.com or www.trainline.eu. 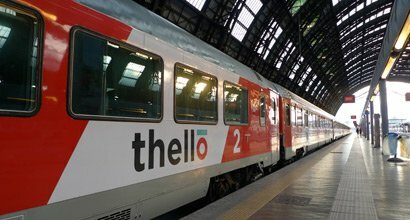 1st class seats on Thello. More space per person than 2nd, with seats arranged 2+1 across the car width. 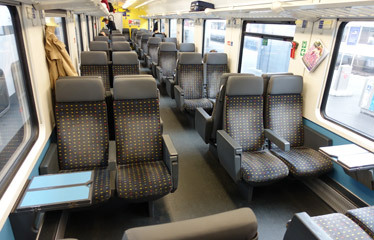 2nd class seats on the Thello train. Very comfortable, seat arranged 2+2 across the car width. 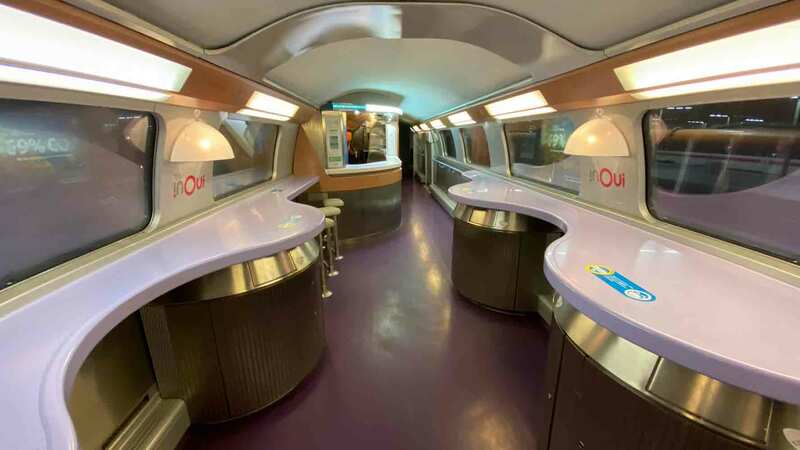 The small cafe-bar counter on the Milan to Nice & Marseille Thello train serving tea, coffee, wine, beer, soft drinks and snacks. Views from the train, along the Ligurian coast between Milan and Nice. Photos courtesy of Lucas Martin. Leave Munich Hbf at 06:48, change at Cologne Hbf, arriving Brussels Midi at 13:35. Leave Munich Hbf at 10:55, change at Cologne Hbf, arriving Brussels Midi at 17:35. Leave Munich Hbf at 12:50, change at Frankfurt (Main), arriving Brussels Midi at 19:35. Leave Munich Hbf at 14:51, change at Cologne Hbf, arriving Brussels Midi at 21:35. But times vary, so go online and see. Fares start at €39.90 in 2nd class or €69.90 in 1st class. Fares are dynamic, so book ahead for the best prices. 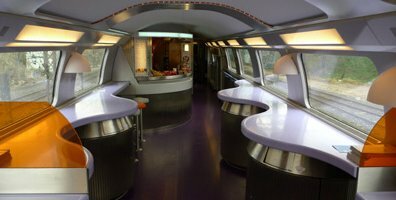 You can buy tickets for both the ICE+ICE and the ICE+Thalys options at the Belgian Railways site www.b-europe.com, which can book you through from Munich to Bruges or anywhere in Belgium. Anyone from any country can use www.b-europe.com, you print your own ticket. You can also book from Munich to Brussels, Bruges or elsewhere in Belgium at the German Railways website www.bahn.de, although this site cannot sell tickets for Thalys so will only show fares and sell tickets for Munich-Belgium journeys involving their own ICE trains between Cologne and Brussels. You print your own ticket or can simply show it on your smartphone or laptop screen. 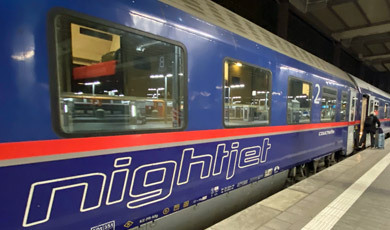 Take the 22:52 Nightjet sleeper train from Munich Hbf to Cologne Hbf, arriving 08:15. Fares start at €59 in 6-berth couchettes, €69 in 4-berth couchettes, €99 in a 2-bed sleeper or €139 in a single-bed sleeper. 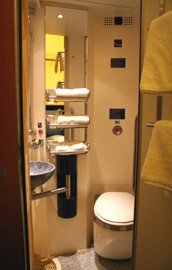 Deluxe sleepers with en suite toilet & shower are also available, there's a shower for passengers in regular sleepers at the end of the corridor, A light breakfast is included in sleepers & couchettes, served in your compartment. There's a lovely run along the scenic Rhine Valley route in the morning between Mainz & Koblenz (06:04-07:05), past mountains, vineyards, castles, river boats and the legendary Lorelei Rock. 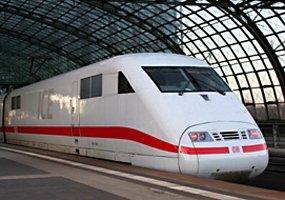 Then take an ICE a high-speed ICE train leaving Cologne Hbf at 09:43 and arriving Brussels Midi at 11:35, fares from €19.90 in 2nd class or €49.90 in 1st class. Book Munich-Brussels using www.bahn.de looking for the option marked NJ, ICE. If you have any problems, book each train separately. 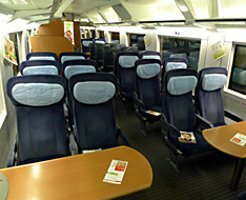 You can also book the Munich-Cologne sleeper at www.trainline.eu which links to the Austrian rather than German system so can be cheaper. In all cases, you print your own tickets. Leave Munich Hbf at 06:16, change at Hannover, arriving Amsterdam Centraal at 15:00. Leave Munich Hbf at 07:52, change at Düsseldorf, arriving Amsterdam Centraal at 15:28. Leave Munich Hbf at 09:51, change at Düsseldorf, arriving Amsterdam Centraal at 17:28. Leave Munich Hbf at 12:50, change at Düsseldorf, arriving Amsterdam Centraal at 20:28. Leave Munich Hbf at 14:28, change at Mannheim, arriving Amsterdam Centraal at 21:58. Leave Munich Hbf at 15:51 (not Saturdays), change Düsseldorf, Amsterdam Centraal arrive 23:28. But times vary, so go online at www.bahn.de and see. Buy tickets at the German Railways website www.bahn.de and print your own ticket or show it on your smartphone or laptop screen. I recommend registering when prompted so you can always log in and check or re-print all your bookings. Step 1, travel from Munich to Frankfurt or Cologne by Austrian Nightjet sleeper train, leaving Munich Hbf at 22:52 and arriving at Cologne Hbf at 08:15 next morning. 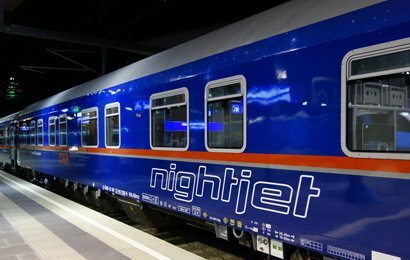 This modern Austrian Nightjet train has an air-conditioned sleeping-car (1, 2 & 3-berth compartments with washbasin, plus three deluxe compartments with 1, 2 or 3 beds with private shower & toilet), couchette cars (4 & 6 berth compartments) & ordinary seats. The sleeper & couchette fares include a light breakfast with tea or coffee in the morning. Fares start at €59 in 6-berth couchettes, €69 in 4-berth couchettes, €99 in a 2-bed sleeper or €139 in a single-bed sleeper. Deluxe sleepers with en suite toilet & shower are also available. 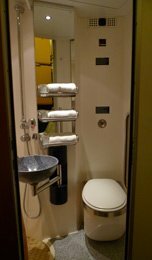 There's a shower at the end of the corridor for passengers in the regular sleepers. A light breakfast is included in sleepers & couchettes, served in your compartment. Book this train using either the German Railways website www.bahn.de or www.trainline.eu and print your own ticket - prices can vary so it's worth checking both sites. The sleeper train makes a lovely morning run along the scenic Rhine Valley between 06:04 & 07:05, past the legendary Lorelei Rock and many castles, vineyards & river boats. A real treat! the river will be on the right hand side of the train. Tip: For a Bavarian dinner & beer before boarding, try www.augustinerkeller.de at Arnulfstrasse 52, just on the north side of Munich Hbf. Tip: If you like, you can check the consist for this train, check car numbers & see in what order cars for different destinations are marshalled using the excellent www.vagonweb.cz. Click the UK flag for English, click composition, then look under Germany & click nj. Step 2, travel from Cologne to Amsterdam by luxurious ICE train leaving Cologne Hbf at 08:41 arriving Amsterdam Centraal at 11:28. Fares start at €19.90 in 2nd class or €49.90 in 1st class booked at www.bahn.de. You print your own ticket. Day 1, take a comfortable ICE train from Munich to Cologne. Trains leave every hour or so, for example you can leave Munich Hbf at 17:28 and arrive Cologne Hbf at 22:05, but by all means take an earlier train and spend a pleasant evening in Cologne. Stay overnight in Cologne. Starting with the cheapest, suggested hotels near to Cologne Hauptbahnhof with good reviews include the Breslauer Hof Am Dom, Hotel Domspitzen, CityClass Hotel Europa am Dom, Hilton Cologne, Excelsior Hotel Ernst am Dom. Day 2, catch a morning train to Amsterdam. For example, the 06:41 ICE3 train from Cologne Hbf arrives Amsterdam Centraal at 09:28, but by all means have a leisurely breakfast and catch a later train, they leave every couple of hours. Buy tickets using the German Railways website www.bahn.de like this: Set up an enquiry from Munich to Amsterdam, but click Add intermediate stops and put Cologne Hbf in the via box with your desired stopover duration in the hh:mm box, say 10 hours. Why not allow more time for a wander round Cologne, visiting the cathedral right next to the station - you can add a stopover of up to 48h duration. Adjust the departure time and stopover duration to get earlier or later trains for each part of the journey with a longer or shorter overnight stop in Cologne. You print your own ticket or simply show it on your smartphone or laptop screen. Tip: If you have more time, take the scenic route along the Rhine Valley to Cologne, rather than the faster high-speed line. This takes an extra hour or so. Simply click Add intermediate stops again and enter Koblenz leaving duration as zero. 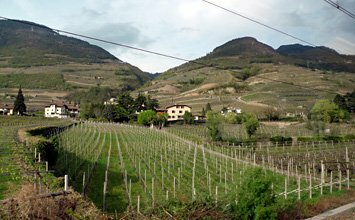 You will now be routed via the twisting Rhine Valley line past castles, vineyards, river boats, and the legendary Lorelei Rock. Indeed, you could make Koblenz the stopover instead of Cologne if you like. See the Rails Down the Rhine page for more information, photos & video. You can travel from Munich to Luxembourg by train in a single day from just €39.90, booked at the German railways website www.bahn.de. In the search results, look for journeys involving just one change at Koblenz. 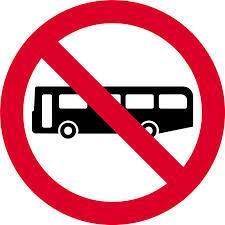 Avoid journeys involving two changes and a bus. 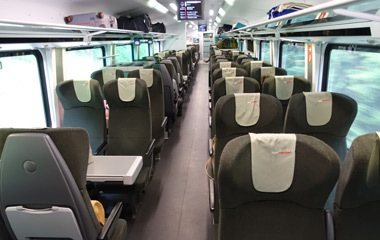 Air-conditioned EuroCity trains with comfortable Swiss carriages and an elegant Swiss restaurant car link Munich Hbf with Zurich HB with onward train connections to all other Swiss cities. These direct EC trains leave Munich Hbf for Zurich at 07:14, 12:15 & 18:15. Journey time around 4h44 centre to centre. This isn't the most frequent service in the world, so it's worth knowing that you can also travel from Munich to Zurich with 1 easy change at Stuttgart. This takes longer, about 5h33, but there are departures every two hours from around 05:41 to 17:47, on comfortable German InterCity (IC) trains. The Stuttgart-Zurich trains are usually excellent double-deck IC trains like these, with great scenery along the River Necker. To check times & buy tickets via this alternative route, see tip 6. 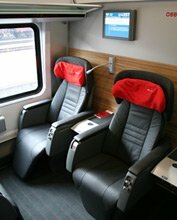 Check times & buy tickets from Munich to any Swiss town or city at www.bahn.de from €39.90 in 2nd class or €69.90 in 1st class. You print your own ticket or simply show it on your smartphone or laptop screen. 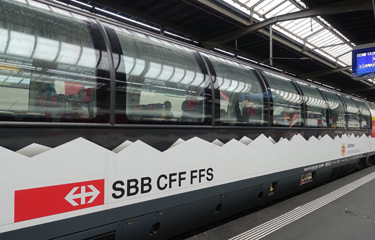 You can book tickets from Munich to Geneva, Luzern, Bern, Interlaken, Zermatt, St Moritz or almost any station in Switzerland this way, at one inclusive cheap price if you pre-book, a lot cheaper than buying a separate onward ticket from Zurich at expensive Swiss domestic prices. I recommend registering when prompted, rather than booking as a guest, so you can always log in and check or re-print all your bookings. Tip 1: In the search results, avoid any departures shown as BUS as this is a long-distance bus not a proper train. When booking Munich to Zurich, click Add intermediate stops and enter Lindau Hbf in the via box, then it's easy to see the trains without having to weed out departures involving a downmarket bus. The EuroCity trains appear as EC in the search results. Tip 2: All the direct Munich-Zurich EuroCity (EC) trains currently include a 1st class panorama car, as well as a regular open-plan 1st class car, see the photos below which show both types. The panorama car is great, with raised floor/seats and massive wrap-around windows. It can be used by any 1st class passenger, just find any empty unreserved seats. 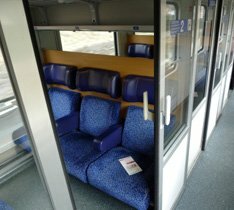 Unfortunately, there's no way to get www.bahn.de to give you reserved seats in the panorama car, it normally just reserves seats in the regular car. 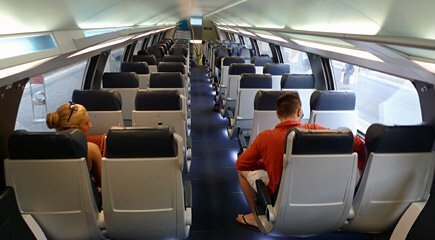 If in the UK, buying tickets by phone on DB's UK phone line 08718 80 80 66 might work, or just reserve seats as a back-up, then board early and nab empty unreserved seats in the panorama car. Tip 3: If you're interested, you can look up the formation of these trains at www.vagonweb.cz to see car numbers, seating plans & more photos. Simply switch it to English, click Composition, then click EC against Germany and look up your specific train. Tip 4: Lindau on the banks of Lake Konstanz is a lovely town for a stopover, even of a few hours. You can add a stopover at no extra charge when you buy a cheap ticket at www.bahn.de simply by clicking Add intermediate stops, entering Lindau and the number of hours you want. 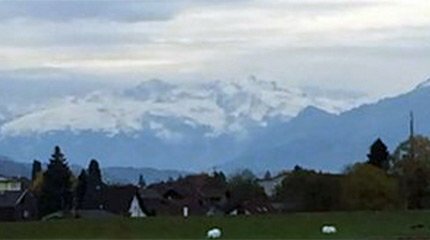 Tip 5: I get a lot of people saying they want to use their Swiss pass 'to save money' between the border and their final Swiss destination, let's say Lucerne. But if www.bahn.de will sell you a cheap advance-purchase ticket from Munich to Lucerne from €39, exactly the same price as Munich to Zurich or Munich to the border also from €39, where's the saving? Check prices before wasting a day of an expensive pass! Tip 6: To find the more frequent route with a change in Stuttgart, go to www.bahn.de, click Add intermediate stops, enter Stuttgart as a via station leaving stopover duration as zero. Now click More means of transport and change both sectors from admit changes to direct connections. You should now see a departure every 2 hours with 1 change at Stuttgart. A EuroCity train between Munich and Zurich, at Zurich HB. 2nd class seating... Larger photo. 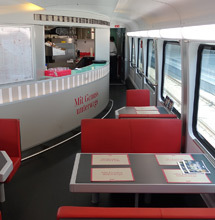 Swiss restaurant car: Treat yourself! Larger photo. 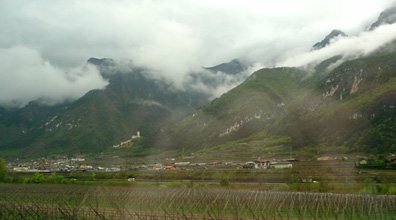 Scenery from the train. Courtesy Discoverbyrail.com. Normal 1st class seating... Larger photo. 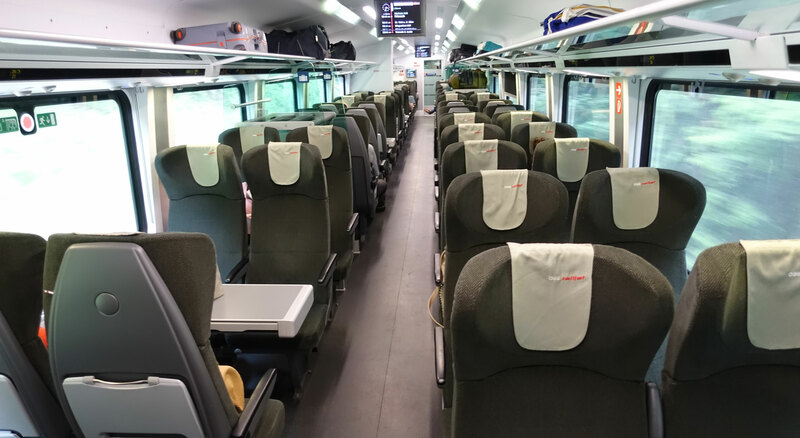 Every couple of hours, a comfortable EuroCity train run by German & Austrian Railways links Munich and Verona via the scenic Brenner Pass, see the Brenner Pass scenery video here. 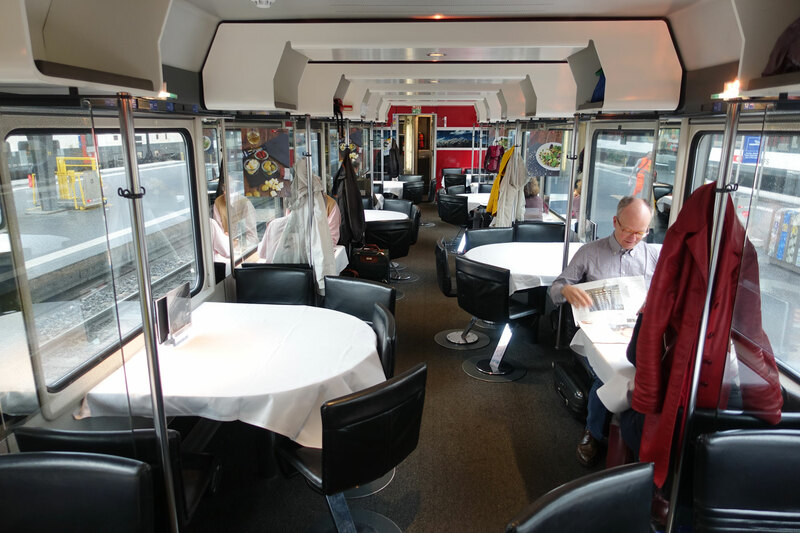 All these trains have an elegant Austrian waiter-service restaurant car, so treat yourself to lunch or dinner with a beer or some wine as the mountains roll by. More photos & information about these EuroCity trains. Departures from Munich Hbf to Verona Porta Nuova are at 07:34, 09:34, 11:34, 13:34 & 15:34, journey time 5h24. The 07:34 from Munich runs beyond Verona to Bologna Centrale on weekdays, to Venice Santa Lucia on weekends. The 09:34 from Munich runs beyond Verona to Bologna Centrale every day. The 11:34 from Munich runs beyond Verona to Venice every day, arriving Venice Santa Lucia in central Venice at 18:10. Change at Verona Porta Nuova (or on the 09:34, at Bologna) for Florence SMN, Rome Termini and Naples Centrale. Fares from Munich to Verona or (on the direct trains) Bologna or Venice start at €39.90 in 2nd class or €69.90 in 1st class. To buy tickets from Munich to anywhere in Italy as one seamless transaction, use www.loco2.com as follows: Enter Munich to any destination you like in Italy. Click More options, enter Verona (any station) (or if taking the 09:34 from Munich and heading for Florence, Rome Naples, enter Bologna) and set stopover duration to 45 minutes. Then run the enquiry. Loco2 can be used by anyone from any country, all international cards accepted, no booking fee, you can pay in £ or € and you print your own tickets or show them on your smartphone screen. Step 1, buy tickets for these direct trains at the German Railways website www.bahn.de and print your own ticket or simply show it on your smartphone or laptop screen. I recommend registering when prompted rather than booking as a guest, so you can always log in and check or re-print all your bookings. 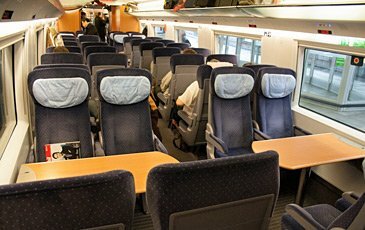 Tip: It's worth checking the whole journey from Munich to Florence, Rome, Naples or Venice on www.bahn.de, as occasionally you'll see an inexpensive through fare allowing you to buy one ticket in one place for the whole trip, but this doesn't always appear so you'll need to move on to step 2 below. Though always worth checking! Step 2, then buy an onward Italian ticket from Verona Porta Nuova or Bologna Centrale to Florence SMN, Rome Termini, Milan Centrale or Naples Centrale at either www.italiarail.com (easy to use, recognises English place names, the small booking fee will be refunded if you email them at seat61@italiarail.com with your PNR) or Italian Railways own website www.trenitalia.com (more fiddly to use, requires Italian language place names, no booking fee, read this advice on using it first). I recommend allowing at least 45 minutes to change in Verona Porta Nuova in case of any delay. The restaurant car on a EuroCity from Munich, arrived at Verona. You don't need to book a table, just go along and sit down. Dining on the move as the scenery glides by is one of the pleasures of travelling on trains like this. More photos & information about these EuroCity trains. A nightjet leaves Munich Hbf at 20:10 for Milan Centrale (arriving 09:12), Florence SMN (arriving 06:19) and Rome Termini (arriving 09:22). Another nightjet leaves Munich Hbf at 23:20 for Venice Santa Lucia, arriving 08:24. Fares start at €59 in 6-berth couchettes, €69 in 4-berth couchettes, €99 in a 2-bed sleeper or €139 in a single-bed sleeper. Deluxe sleepers with en suite toilet & shower are also available. 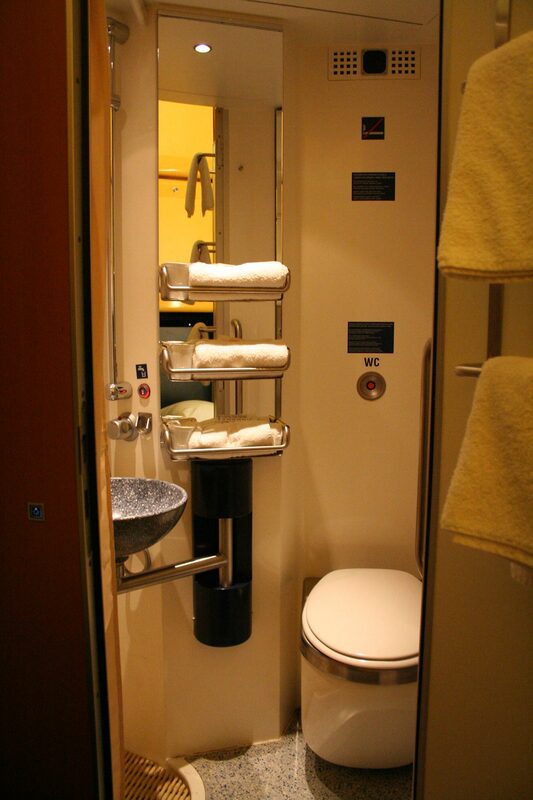 There's a shower at the end of the corridor for passengers in the regular sleepers. A light breakfast is included in sleepers & couchettes, served in your compartment. See the Nightjet information page. Buy tickets using the German Railways website www.bahn.de, just look for the NJ train with 0 changes in the search results. You print your own ticket. You can also book at www.trainline.eu. Dinner before boarding your sleeper? There's no restaurant car, so for a typically Bavarian dinner & beer or two before boarding, I recommend the www.augustinerkeller.de at Arnulfstrasse 52, to the north side of Munich Hbf. Tip: If you like, you can check the consist for these trains, check car numbers & see in what order cars for different destinations are marshalled using the excellent www.vagonweb.cz. Click the UK flag for English, click composition, then look under Germany & click nj. 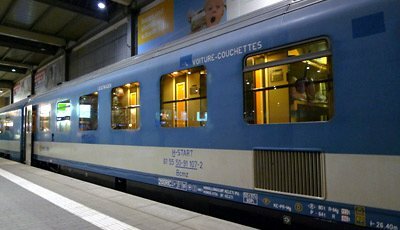 Step 1, take a direct high-speed TGV Duplex leaving Munich Hbf at 06:46 (06:23 on Sundays) and arriving Paris Gare de l'Est at 12:33 (12:05 on Sundays), from €39 in 2nd class or €69 in 1st class booked at the German Railways website www.bahn.de. You print your own ticket or simply show it on your smartphone or laptop screen. Cross Paris to the Gare de Lyon. Have lunch in Paris, ideally at the celebrated & historic Train Bleu restaurant inside the Gare de Lyon. Step 2, travel from Paris to Barcelona by high-speed TGV Duplex, leaving Paris Gare de Lyon at 14:07 and arriving Barcelona Sants at 20:34. Fares start at €39 in 2nd class or €59 in 1st class. Book this at www.loco2.com (can be used by anyone from any country, no booking fee, print-at-home tickets) or www.trainline.eu (can be used by anyone from any country, no booking fee, choice of upper or lower deck, print-at-home tickets). What's the journey like? See the photos & video on the Paris to Barcelona page. You'll pass the Chateau de Montfaucon on the river Rhone, Béziers cathedral, flamingos on the lakes in the South of France between Montpelier and Perpignan, the historic Fort de Salses right by the tracks, with great views of the massive Mt Canigou in the Pyrenees, visible all the way from Perpignan to Girona. Step 3, stay overnight in Barcelona (see suggested hotels near Barcelona Sants station) and book onward high-speed trains next morning from Barcelona to Madrid, Seville, Malaga, Alicante etc, using either www.loco2.com (easy to use, in €, £ or $) or www.petrabax.com (in US$, also easy to use, small mark-up) or the Spanish railways website www.renfe.com (in €, more fiddly to use). You'll find cheap Promo and Promo+ fares if you book in advance. There's an 08:30 AVE high-speed train from Barcelona Sants direct to Cordoba, Malaga & Seville. In all cases, you print your own ticket. Stay the night in Geneva and enjoy a morning there. Hotels with good reviews near the station include Hotel Cornavin Geneve, Hotel Les Arcades, ibis Styles Geneva Gare. Step 2, travel from Geneva to Barcelona by train. Usually you'll find a TER regional train leaving Geneva at 11:31, change trains at Lyon Part Dieu (arrive 13:22, depart 14:24) onto a direct AVE-S100 high-speed train train arriving Barcelona Sants at 19:30. Fares start at around €69 in 2nd class. Book this at www.loco2.com (can be used by anyone from any country, no booking fee, recommended), www.raileurope.com (US & Canadian residents), www.raileurope-world.com (residents of Australia, Canada, Asia, Africa, South America) or www.trainline.eu (anyone from any country, no booking fees, with seating options). You usually print your own ticket. What's the journey like? Between Valence & Barcelona you'll follow the same route taken by the Paris-Barcelona TGVs, see the photos & video on the Paris to Barcelona page. You'll pass the Chateau de Montfaucon on the river Rhone, Béziers cathedral, flamingos on the lakes in the South of France between Montpelier and Perpignan, the historic Fort de Salses right by the tracks, with great views of the massive Mt Canigou in the Pyrenees, visible all the way from Perpignan to Girona. TGV Duplex at Paris Gare de Lyon. These 200 mph double-deckers link Paris with Barcelona. 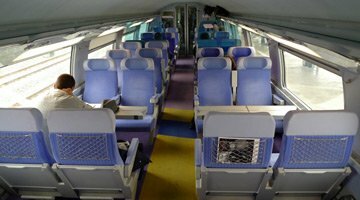 Watch TGV Duplex video. Cafe-bar on the upper deck in car 4, serving tea, coffee, soft drinks, wine, beer, snacks & microwaved hot dishes..
2nd class seats on the is upper deck. There's a mix or tables for 4 and unidirectional seating. 360º photo. Mt Canigou & the Pyrenees... One of the highest peaks in the mighty Pyrenees, the 2,784m (9,137 feet) high Mt Canigou dominates the skyline on the right all the way from Perpignan to Girona, see en.wikipedia.org/wiki/Canigou. More photos of what to see on the Paris-Barcelona train journey. Travel from Munich Hbf to Paris Gare de l'Est by any suitable afternoon departure as shown above, from €39.90 booked at www.bahn.de. Stay overnight in Paris, see suggested hotels near the Gare du Nord & Gare Montparnasse. 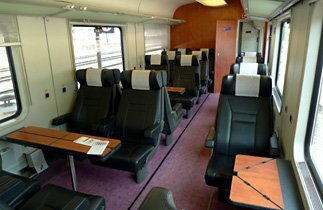 Travel from Paris Gare Montparnasse to Hendaye on the Spanish border by TGV then by Sud Express sleeper train to Lisbon as shown in the Paris to Lisbon section here. The express trains run every hour or so taking as little as 1h28. 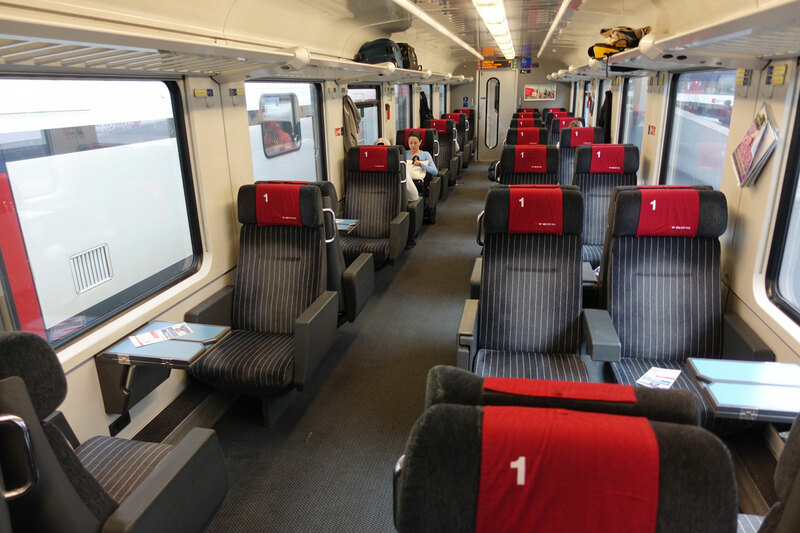 They are either a smart Austrian railjet train (RJX) with restaurant car, WiFi & power sockets at all seats, or a comfortable Austrian EuroCity train (EC) with restaurant car. These trains have dynamic pricing from €19.90 if you book in advance (specified train only, no changes to travel plans, limited or no refunds) rising to €34 (EuroCity) or €38 (railjet) standard price bought on the day and good for any train, reservation optional. Buy tickets & check train times at the German Railways website www.bahn.de. You print your own ticket or simply show it on your smartphone or laptop screen. 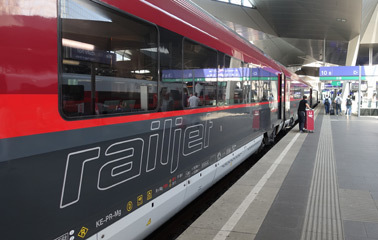 The regional trains run every hour, branded Meridian and shown on www.bahn.de as 'M'. They take 1h47, but they're cheaper and more flexible than the express trains. They have one fixed-price flexible fare, around €32 one-way, good for any Meridian train that day, no advance reservation is necessary or possible, it cannot sell out. Turn up, buy a ticket, get on, sit where you like and go! You print your own ticket or simply show it on your smartphone or laptop screen. But for regional trains you'd usually buy a Bayern Ticket: In practice, you'd only ever buy a €32 full-price ticket for the Meridian trains if you needed to leave before 09:00 on weekdays, because at all other times it's cheaper to buy a Bayern Ticket which gives a day's unlimited travel on regional trains (including Meridians) across the whole of Bavaria including Salzburg, after 09:00 weekdays or any time at weekends. This costs just €25 for the first traveller + €7 for each additional traveller in your party up to maximum 5 people. For details & online sales see www.bahn.com/i/view/GBR/en/prices/germany/laender-ticket.shtml. This would even allow you to make a same-day round trip from Munich to Salzburg! You can buy a Bayern Ticket online and show it on your smartphone or laptop or you can buy at the station on the day. For Hallstatt, travel to Salzburg as shown above, then take a train to Attnang Puchheim for the local train to Hallstatt. Simply check times & buy a ticket from Munich to Hallstatt at www.bahn.de from €29.90, total journey time as little as 4h08. You print your own ticket. Tip: It's worth checking www.trainline.eu as well, as this links to the Austrian system and can sometimes be cheaper. 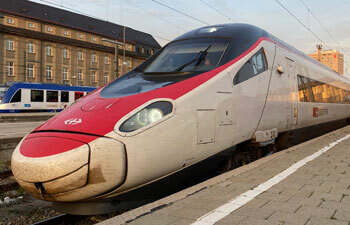 Smart Austrian railjet trains run from Munich Hbf to Linz & Vienna Hbf every two hours from 06:23 to 17:30. 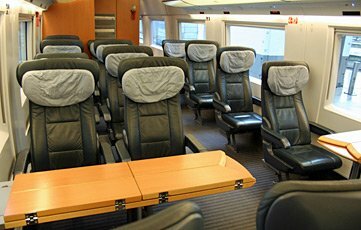 Munich to Vienna takes only 4 hours city centre to city centre, with a restaurant car, power sockets at all seats and free WiFi. Fares start at €29.90 in 2nd class, €39.90 in 1st class or €54.90 in deluxe Business class if you pre-book. A reserved seat is optional and costs an extra €3-€4 - in business class seat reservation is compulsory but included in the fare. Buy tickets at the German Railways website www.bahn.de. You print your own ticket or simply show it on your smartphone or laptop screen. I recommend registering when prompted, rather than booking as a guest, so you can always log in and check or re-print all your bookings. 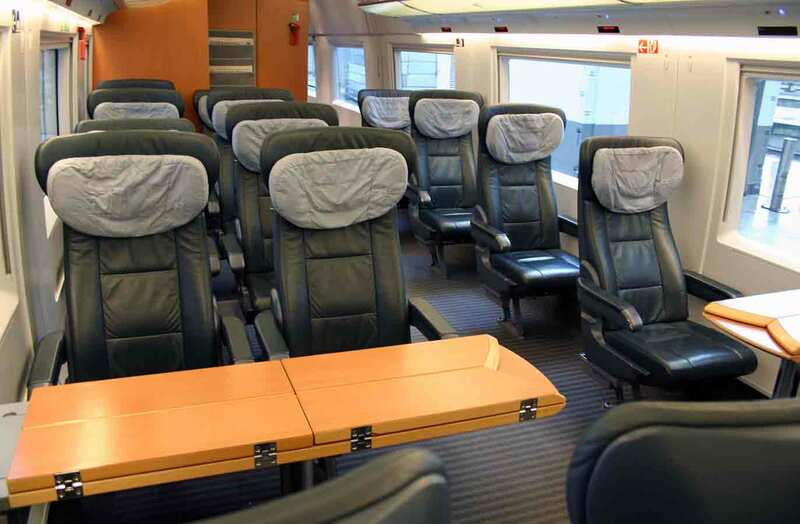 To book business class tickets at bahn.de, book 1st class then use the Show seats seat selection feature to select a seat in the low-density Business class car, usually seats 13-55 in car 27 - although they don't label it as business class so you have to engage brain! It should then add the €15 Business class upgrade to the first class fare when you pay. You can also buy using www.trainline.eu. Tip: It's worth checking www.trainline.eu as well, as this links to the Austrian system. Although fares also start from €29 I've often seen significantly cheaper fares on the Austrian system than bahn.de on the same date & train. The excellent fast railjet trains take just 4 hours with fares from €29.90 if you book in advance and commit to a specific train with limited refunds & no changes to travel plans allowed. What if you don't want to stay flexible & not commit to a specific departure way in advance? Or all the cheap railjet tickets have sold out as you've left it too late? On railjets, full-price paid on the day is around €100. Ouch! Every hour a Meridian regional train runs from Munich Hbf to Salzburg, fare just €25 with a Bayern Ticket (not valid before 09:00 on weekdays) + €6 for each additional passenger. 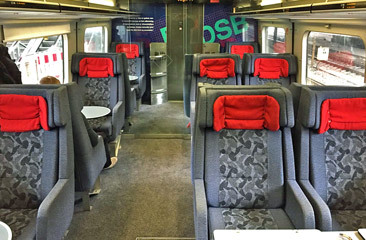 This connects with a twice-an-hour double-deck Westbahn train from Salzburg to Vienna Westbahnhof (hourly) or Vienna Hbf (hourly) for €26.50 per person (€1 extra if you pay on board). The journey is slower at 4h28 overall but the cost is only around €52 in total any day, any train, even bought on the day. Worth knowing about if you need to stay flexible but affordable! You can check Westbahn prices & times at www.trainline.eu or www.westbahn.at, Meridian times & prices at www.trainline.eu or www.bahn.de. The Meridians are the ones marked M in the search results. From June 2019 (originally April, but postponed), Westbahn plan to operate 3 daily direct trains from Munich to Vienna in co-operation with Meridian and in competition with ÖBB's railjets. Trains will leave Munich Hbf 08:55, 14:55 & 17:55, journey time to Vienna Hbf 4h23. You can buy the Bayern Ticket at the station in Munich on the day or you can buy it online as shown here. The Westbahn fare can be paid to the conductor on board the train, or you can save €1 by using a Westbahn ticket machine at Salzburg station or by buying online at www.trainline.eu. All these tickets have unlimited availability at these prices - they cannot sell out! 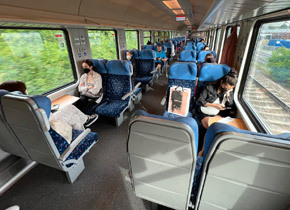 Every couple of hours, comfortable EuroCity trains link Munich with Innsbruck in just 1h44 Most of these trains have a restaurant car and are on their way to Italy. This is the fast comfortable option via Kufstein, and it's scenic enough. Fares start at just €19.90 in 2nd class or €29.90 in 1st class if booked in advance, or around €42 full-flex in 2nd class bought on the day. You can check times and buy tickets at www.bahn.de. You print your own ticket or can simply show it on your smartphone or laptop screen. If you feel like something different there's another slower but very scenic route using regional trains every hour or two. Several services per day are now direct with 0 changes, others involve one simple change at either Garmisch-Partenkirchen, Mittenwald or Seefeld in Tirol. The regular full-price fare is a fixed-price €36.60 in 2nd class or €60.10 in 1st class, unlimited availability, it cannot sell out. However, the system will usually offer you a cheaper €27 ticket, marked Regio-Ticket Werdenfels plus Innsbruck. With this, up to 3 children under 15 go free, a real bargain. You can check train times & buy tickets for this route using www.bahn.de if you click Add intermediate stops and put Mittenwald in the via box, or simply use this link to Bahn.de which I've set up for you. You print your own ticket. No reservation or advance-purchase is necessary, so alternatively you can buy tickets at the station if you like, for the same price, it cannot sell out. You sit where you like on regional trains, going south you'll find the best views on the right hand side of the train. You might like to read up on the Mittenwald Railway here: en.wikipedia.org/wiki/Mittenwald_Railway. 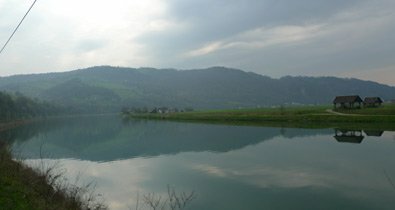 Munich to Prague from €15 - or €35 in 1st class! 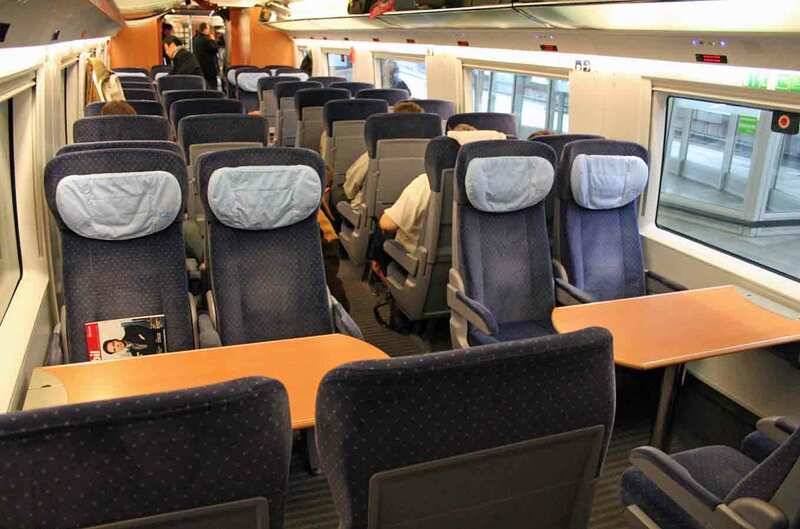 See the Munich to Prague by train page for details of the train service from Munich to Prague, now increased from 4 to 7 trains per day, now all air-conditioned with minibar & free WiFi in most cars. Do not use the German Railways website www.bahn.de on this route, as it cannot sell the cheap €15 fares for these trains, only the expensive full-price fares, and it tries to put you on the DB-run motorway railway-replacement bus, which of course you don't want, you want a train. Option 1, via Plzen. Cheapest & easiest to book, but 2 hours slower than going via Linz. This is the cheapest route, although it's the slower one. For example, at the time I write this, you could leave Munich Hbf at 08:43 and arrive Cesky Krumlov at 18:57 all for just €16.55, with time for a Pilsner beer at the station bar in Plzen and for a wander round Ceske Budejovice! Earlier and later departures are also available. The train from Munich to Plzen is a Munich-Prague Zapadni Express, see the photos & travel tips on the Prague-Munich page. This train is air-conditioned with a refreshment trolley, power sockets and free WiFi. Step 1, go to the Czech Railways website www.cd.cz, switch it to English and set up an enquiry from Munich Hbf to Ceske Budejovice. Now the science bit: Before running the enquiry, click More options then Travel via and enter Plzen Hl.n. as a via station. I also recommend clicking Connection parameters then Transfers and reducing the maximum number of connections from 4 to 1. In the search results, you should now see various departures with 1 easy change at Plzen Hlavni (Hl.n. = Hlavni = main station). Plzen - or Pilsen in English - is of course the city where Pilsner beer originates. Cheap First Minute fares from Munich to Ceske Budejovice start at just €15, or about 367 CZK, a bargain. First Minute fares are limited-availability advance-purchase fares, they are only good for the specific train you book, limited or no refunds or changes to travel plans. If you buy at the station on the day you pay significantly more for a full-flex ticket good for any train. Step 2, now check train times from Ceske Budejovice to Cesky Krumlov at jizdnirady.idnes.cz/vlaky/spojeni. 10 minutes is plenty to change trains, if you miss it you can always have a coffee and catch the next one. The little green-&-orange GWTR local trains run every hour or so, journey time 44 minutes. It has luggage space, a toilet, power sockets and free WiFi, it's a leisurely journey on a winding single track branch line past farmland & forest. See more useful information about visiting Cesky Krumlov including photos & info on taxis from the station to Cesky Krumlov old town. Option 2, via Linz. Significantly faster, but more expensive and must be booked in 3 stages rather than 2. This is the fastest and most direct route, with the swisher trains. For example, at the time I write this, you can leave Munich Hbf at 09:30 and arrive Cesky Krumlov at 16:57, all from €40, with time for a beer in Linz. Earlier and later departures are also available. Tip: I recommend at least 40 minutes between trains in Linz. When the search results appear, choose the departure you want and click Show details. If the interchange time is much less than 40 minutes, click Adjust the transfer time against the change of train in Linz and select Later departure from Linz, and at least 40 minutes. Step 1, travel from Munich Hbf to Linz Hbf in 2h45 by swish Austrian railjet train with restaurant car, power sockets at seats & free WiFi. At Linz Hbf, changing trains simply means stepping off one train, walking to another train and stepping on, but as you will be on separate tickets I'd allow at least 40 minutes between trains in case of delay. 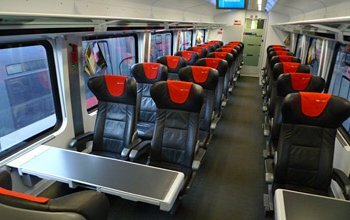 Step 2, travel from Linz Hbf to Ceske Budejovice in around 2h02 by comfortable air-conditioned express, with power sockets at seats. There may be a refreshment trolley, but it's best to take you own food & drink for this bit. At Ceske Budejovice you simply step off one train and walk to the other train, if necessary via the underpass between platforms. Changing trains only takes 3 minutes, if you miss one you have a beer and catch the next one. Incidentally, Ceske Budejovice might sound more familiar by its former Germanic name, Budweis. That's right, where the name of the beer comes from! The town is worth a look around in its own right. Why not take an earlier train and have a wander into the old town? Step 3, travel from Ceske Budejovice to Cesky Krumlov on the little green-&-orange GWTR local train. This runs every hour or so, journey time 44 minutes. The GWTR local train has luggage space, a toilet, power sockets and free WiFi, it's a leisurely journey on a winding single track branch line past farmland & forest. (1) Munich to Linz: Cheap Sparschiene fares start at €29. The price varies, book early for cheaper prices. (2) Linz to Ceske Budejovice: Cheap advance-purchase fares called Sparschiene by ÖBB Austrian Railways or First Minute by CD Czech Railways start at just €9. (3) Ceske Budejovice to Cesky Krumlov costs 40 CZK, about €1.55. Sparschiene & First Minute fares are limited-availability advance-purchase fares, they are only good for the specific train you book, limited or no refunds or changes to travel plans - hence the advice to allow 40 minutes between trains in Ceske Budejovice! If you buy at the station on the day you'll pay the standard price which costs significantly more, but has unlimited availability and is good for any train that day. (1) Munich to Linz: Buy tickets using either www.trainline.eu (easiest, international payment cards no problem) or www.oebb.at (same prices, a bit more fiddly) and print your own ticket. (2) Linz to Ceske Budejovice: Buy tickets using www.trainline.eu, or Austrian Railways www.oebb.at or Czech Railways www.cd.cz and print your own ticket - buy from whichever is cheaper, they all sell tickets for the same trains. Booking should open 6 months ahead on oebb.at or 90 days ahead on cd.cz, less than this when the mid-December timetable change is approaching. But you only need to book weeks ahead to get the cheap fares, there's no need to book months ahead. This is easy once you know you have to split the booking! First, go to German Railways www.bahn.de and book a smart Austrian railjet train from Munich to Vienna Hbf in just 3h56 from €29.90 in 2nd class or €59.90 in 1st class. I'd also check prices at www.trainline.eu, as this links to the Austrian Railways ticketing system so can sometimes be cheaper than the German system for these trains. Now buy a €10.80 ticket from Vienna Hbf to Bratislava Hlavna at the station in Vienna, no reservation necessary or even possible, and simply hop on the next hourly train to Bratislava Hlavna, journey time 1h06. You can check Vienna-Bratislava train times & price at www.trainline.eu and buy a ticket online just to save time, a normal €10.80 ticket is good for any regional train that day. 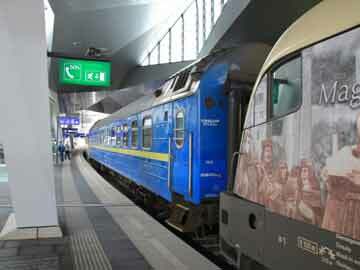 The hourly regional express train from Vienna to Bratislava Hlavna, about to leave from Vienna Hauptbahnhof. 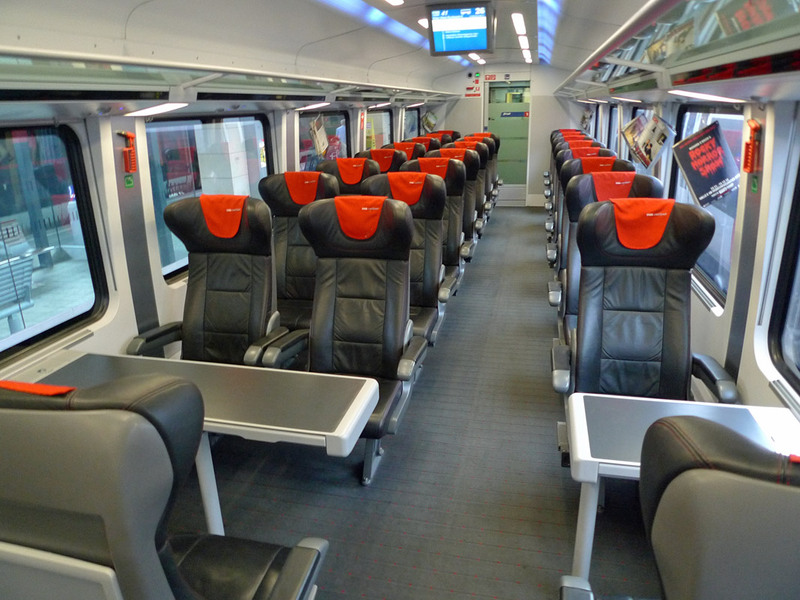 Tip: Behind the locomotive there's usually a smart Slovakian air-conditioned intercity coach, whilst the rest of the train consists of more basic non-air-con Austrian City Shuttle carriages, with interiors as shown in the photo above right. Find a seat in the more comfortable Slovakian car if you can! Smart Austrian railjet trains leave Munich Hbf for Budapest Keleti at 07:23, 09:30, 11:30 & 13:30 taking 6h50 city centre to city centre. Fares start at €39.90 in 2nd class, €69.90 in 1st class or €84.90 in business class (= premium first class) if you pre-book. 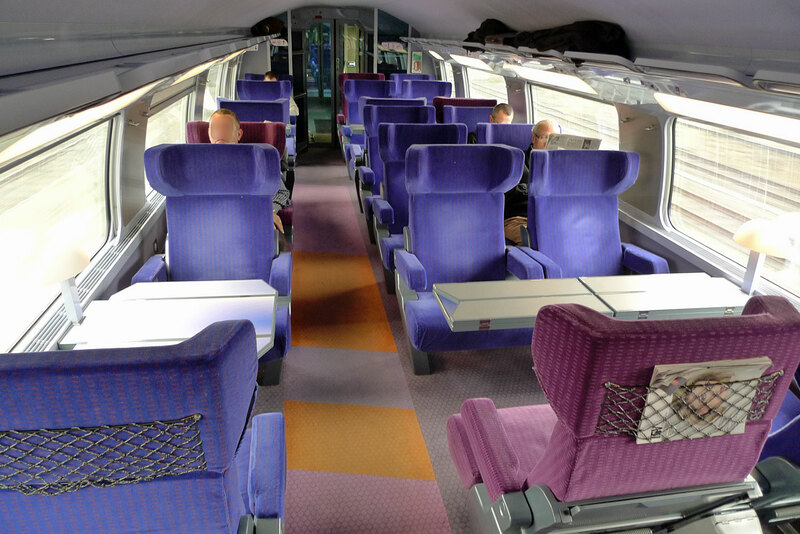 A reserved seat is optional and costs an extra €3-€4 (in business class it's compulsory and included in the fare). The trains have a bistro-restaurant car, and in 1st & business class orders are taken and food served at your seat, so treat yourself to lunch or dinner. There are power sockets at all seats & free WiFi. Look out for a great view of Salzburg citadel on the right as the train crosses the Rover Salzach approaching Salzburg station. See more information about railjet trains. Buy tickets at the German Railways website www.bahn.de and print your own ticket. I recommend registering when prompted, rather than booking as a guest, so you can always log in and check or re-print all your bookings. To book Business class tickets at www.bahn.de, book 1st class and use the Show seats seat selection feature to select a seat in the low-density Business class car, usually seats 13-55 in car 27 - although they don't label it as business class so you have to engage brain! It should add the €15 business class upgrade to the first class fare when you pay. You can also book at www.trainline.eu which can easily book business class. Between Vienna & Budapest it's largely flat, with more wind turbines than you can shake a stick at, allegedly over 200. This photo pretty much sums up that section of line! The EuroNight sleeper train Kalman Imre leaves Munich Hbf at 23:20 and arrives at Budapest Keleti at 09:19. 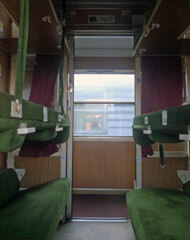 It has a comfortable air-conditioned Hungarian couchette car & sleeping-car, see the Hungarian sleeping-car video. The sleeper fare includes morning tea or coffee. Fares start at €49 in a 6-berth couchette, €59 in a 4-berth couchette, €79 with a bed in a 2-bed sleeper or €139 in a single-bed sleeper. Buy tickets online at www.bahn.de, in the search results just look for the option with 0 changes marked 'EN'. You print your own ticket. If you have any problems or don't see any cheap tickets, you can also book this train at www.trainline.eu. This links to the Austrian Railways ticketing system so can have different prices, sometimes cheaper. Again, you just print your own ticket. Tip: For a Bavarian dinner & beer or two before boarding, try www.augustinerkeller.de at Arnulfstrasse 52, to the north side of Munich Hbf. Tip: If you like, you can check the consist for this train, check car numbers & see in what order cars for different destinations are marshalled using the excellent www.vagonweb.cz. Click the UK flag for English, click composition, look under Germany & click EN, then look for Kalman Imre. Option 1, by railjet to Budapest and sleeper train Ister to Brasov & Bucharest... Easily booked online with cheap advance-purchase fares. Step 2, take the EuroNight sleeper train Ister leaving Budapest Keleti at 19:10 and arriving Brasov at 09:30 & Bucharest Gara de Nord at 12:30 next day. 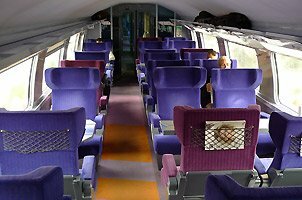 This comfortable train has 4 & 6 berth couchettes and a modern air-conditioned sleeping-car with 1, 2 & 3 bed compartments with washbasin, also deluxe sleepers with 1 or 2 beds and shower/toilet. Fares start at €39 with a couchette or €59 with a bed in a sleeper. There's no restaurant car so take a picnic and bottle of wine. There's great scenery through the Carpathian mountains beyond Brasov, a real treat. Tip: If you like, you can check the consist for this train, check car numbers & see in what order cars for different destinations are marshalled using the excellent www.vagonweb.cz. Click the UK flag for English, click composition, then look under Hungary & click IC. To book the Budapest to Bucharest train, use the Hungarian Railways website www.mavcsoport.hu, clicking 'EN' for English top left. You collect your tickets from the yellow self-service ticket machines at Budapest Keleti station. Option 2, by railjet to Vienna and daily sleeper train Dacia Express to Sighisoara, Brasov & Bucharest. Take the 13:30 railjet train from Munich arriving at Vienna Hbf at 17:30, from €29.90 booked at www.bahn.de. You print your own ticket. You can book this train at the Austrian Railways website www.oebb.at which can sell cheap sparschiene fares from Vienna to Bucharest for as little as €49 with a couchette in a 6-berth compartment, €69 with a bed in a 3-berth sleeper, €89 with a bed in a 3-berth sleeper or €149 with a bed in a single-berth sleeper, all to yourself. In the search results, look for the direct train marked D with no changes. If it says not available you can't book it, but if a sparschiene fare is shown you can. You collect tickets from an ÖBB ticket machine in Vienna. Tip: If you like, you can check the consist for this train, check car numbers & see in what order cars for different destinations are marshalled using the excellent www.vagonweb.cz. Click the UK flag for English, click composition, look under Austria & click D, then look for Dacia. The Dacia Express boarding at Vienna Hbf. Always book a couchette, not just a seat. 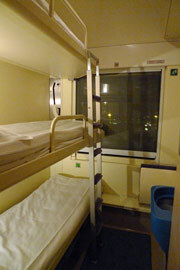 Couchettes convert from bunks at night to seats for day use. 4 or 6 berth couchettes. Larger photo. A 1, 2 or 3-bed sleeper with washbasin. Larger photo. The sleeping-car of the Dacia Express arrived at Sighisoara. Sleepers convert from beds to private sitting rooms for day use. Courtesy of Philip Dyer-Perry. 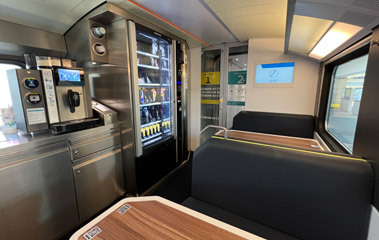 Enjoy breakfast in the bar-bistro eastbound, or an evening beer westbound, as a bar-bistro is attached in Romania to both the Ister & Dacia Express. Bar-bistro photos courtesy of Philip Dyer-Perry. Day 1, take any railjet train you like from Munich to Budapest Keleti in 6h46 from €39.90 in 2nd class or €69.90 in 1st class, booked at www.bahn.de. 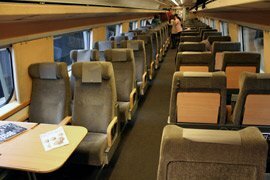 Day 2, take a comfortable air-conditioned Intercity train from Budapest Keleti to Cluj, Timisoara, Sibiu, Sinaia, Brasov or Bucharest, check times & buy tickets from €29 at Hungarian Railways www.mavcsoport.hu, see advice on using mavcsoport.hu & how you collect tickets. It's an all-day daytime run right across Transylvania, see the Trains from Budapest page for full details. Munich Hbf depart 07:52, change Berlin Hbf, arrive Warsaw Centralna at 19:25. Munich Hbf depart 11:57, change Berlin Hbf, arrive Warsaw Centralna at 23:06. You can buy a ticket from Munich to Warsaw as a single transaction at the German railways website www.bahn.de. You print your own tickets. Tip: Although you're covered for a missed connection with a through ticket, I recommend adjusting the Duration of transfer on bahn.de from standard to at least 45 minutes to ensure a robust connection in Berlin even if there's a delay. Step 1, travel from Munich to Prague by air-conditioned express leaving Munich Hbf at 06:43 and arriving Prague Hlavni at 12:19. Book this from €15 in 2nd class or €35 in 1st class at www.cd.cz and print your own ticket. Have lunch in Prague. 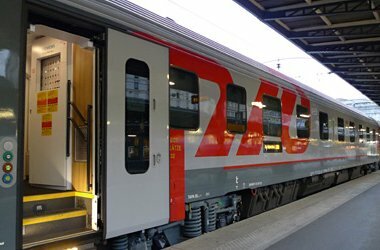 Step 2, travel from Prague to Warsaw by air-conditioned EuroCity train with restaurant car, leaving Prague Hlavni at 14:24 and arriving Warsaw Centralna at 22:39. Book this from €19 at www.cd.cz and print your own ticket. Step 1, travel from Munich to Prague by air-conditioned express leaving Munich Hbf at 14:43 and arriving Prague Hlavni at 20:19. Book this from €15 in 2nd class or €35 in 1st class at www.cd.cz and print your own ticket. Have dinner in Prague. Step 2, travel from Prague to Warsaw by EuroNight sleeper train leaving Prague Hlavni at 22:15 and arriving Krakow at 06:17 & Warsaw Centralna at 09:14. 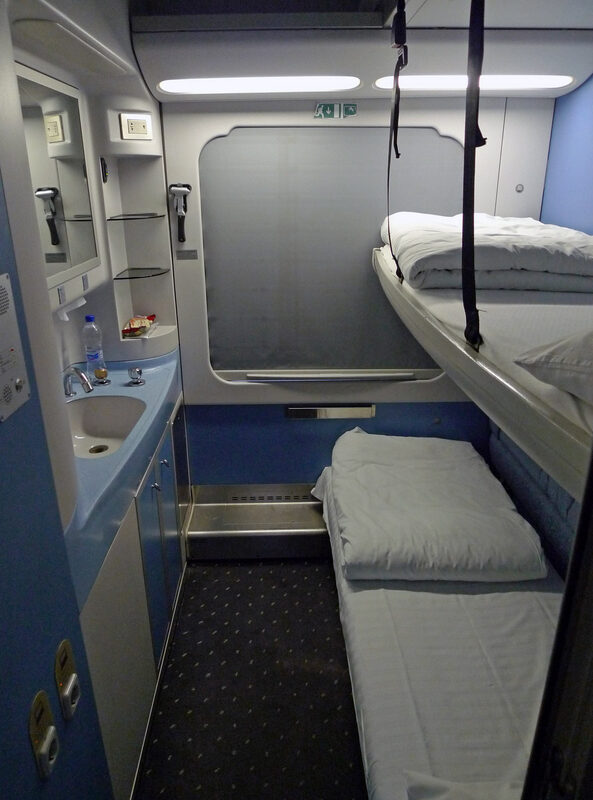 This train has a modern air-conditioned Polish sleeping-car with 1, 2 & 3 bed compartments with washbasin, plus two deluxe 1 or 2 bed compartments with en suite toilet & shower, see the photos below. It also has a couchette car with economical 4 & 6 bunk compartments. Book this from €29 with couchette at www.cd.cz and print your own ticket. Step 1, take a comfortable afternoon railjet train leaving Munich Hbf at 15:30 and arriving Vienna Hbf at 19:30. The train has a bistro-restaurant car, power sockets at all seats & free WiFi. 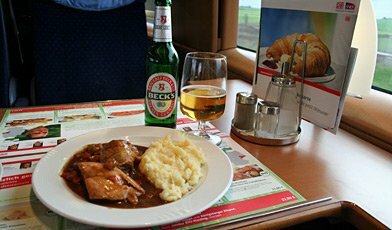 You can also take the 17:30 from Munich, but when catching a sleeper I'd play safe and take the earlier one with time for dinner in Vienna. Book this train from €29.90 in 2nd class or €39.90 in 1st class at www.bahn.de and print your own ticket. Step 2, take the EuroNight sleeper train leaving Vienna Hbf at 22:10 and arriving Krakow at 06:17 & Warsaw Centralna at 09:14. Book this train at the Austrian railways website www.oebb.at. Fares from €39 with a couchette, from €79 with a bed in a 2-bed sleeper. You collect tickets from the self-service machines at Vienna Hbf. 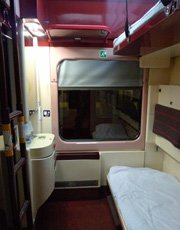 Standard sleeper in evening/morning mode with seats folded out. Standard sleeper set up as a 3-berth. It can also be sold as a single or double. Deluxe sleeper, set up as a 2-berth, showing TV & wardrobe. The morning train leaves Munich Hbf at 08:17, this is smart Austrian railjet train from Munich to Villach on the Austrian/Slovenian border where there's a simple cross-platform 10-minute change onto a Slovenian & Croatian train to for Lesce-Bled, Ljubljana & Zagreb. The afternoon train leaves Munich Hbf at 12:18, this is a direct air-conditioned train with restaurant car to Lesce-Bled, Ljubljana & Zagreb. There's a third departure from Munich Hbf at 14:18 to Lesce-Bled & Ljubljana. Fares start at just €39.90 in 2nd class or €69.90 in 1st class if you book ahead. You print your own ticket. 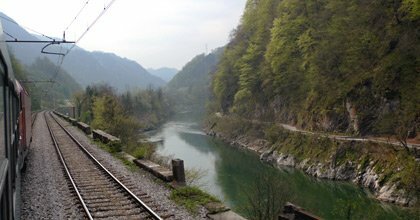 The journey is wonderful, a chance to relax as you cross through the mountains of Austria, then between Ljubljana and Zagreb the train wends its way through the hills along the lovely River Sava, see the photos below. Highly recommended! Warning, avoid the bus! When booking at bahn.de, avoid departures marked BUS as these are long-distance buses which German Railways (DB) has unfortunately started running in competition with its own partners' trains. Make sure the departure you choose is a train, marked EC (= EuroCity). In the link above I have added Kranj to the 'via' box which eliminates these buses from the search results. Booking tip: If you don't see any cheap fares from Munich to Zagreb using bahn.de (for example, if it says No special fares available), try going to the Austrian Railways website www.oebb.at and booking from Salzburg to Zagreb on the same train (it will leave Salzburg about 1h55 after leaving Munich), then using www.oebb.at again to add a ticket from Munich to Salzburg on the same train. Onwards to Split & Dubrovnik... 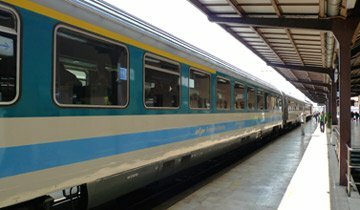 There are daytime trains and a sleeper between Zagreb and Split, from where buses run to Dubrovnik, for details see here. An excellent Croatian sleeper train called the Lisinski leaves Munich Hbf at 23:20 and arrives in Zagreb at 08:35. It has a smart air-conditioned Croatian sleeping-car with 1, 2 & 3 bed compartments, and an air-conditioned Croatian couchette car with 4 & 6 berth compartments, see the Croatian sleeper video here. Fares start at €49 with couchette in a 6-berth compartment, €59 with a couchette in a 4-berth compartment, €89 with a bed in a 2-bed sleeper, €129 with a bed in a single-bed sleeper. How to buy tickets: You can book a couchette or sleeper on this train at the German Railways website www.bahn.de and print your own ticket. 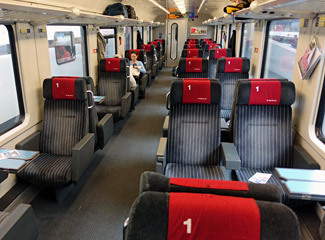 Alternatively, you can also book using www.trainline.eu which connects to the Austrian Railways system so prices may differ from the German site. You also print your own ticket. 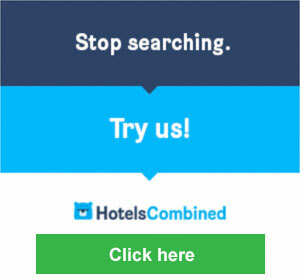 If neither site works for you, you'll need to book by phone. If you live in the UK call German Railways UK number, 08718 80 80 66. Tip: For a Bavarian dinner & a beer or two before boarding the sleeper, try www.augustinerkeller.de at Arnulfstrasse 52, to the north side of Munich Hbf. Step 1, take the 09:30 railjet train from Munich Hbf to Budapest Keleti from €39 booked at www.trainline.eu. You print your own ticket. Make sure you allow at least an hour in Budapest between trains to be on the safe side. 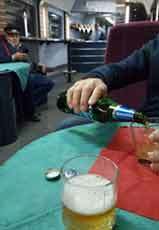 Step 2, travel from Budapest to Split by direct sleeper train called the Adria. This runs from 15 June to 7 September 2018, probably a similar period in 2019, leaving Budapest Keleti at 18:53 every evening arriving Split at 08:56 next morning. 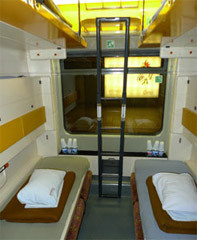 It has a comfortable Hungarian sleeping-car with 1, 2 & 3 bed compartments and a couchette car with 4 & 6 bunk compartments. The fare is around €79 with couchette or from €92 with a bed in a cosy 2-bed sleeper. Check to see if it is bookable online at the Hungarian Railways website www.mavcsoport.hu. If not, you will need to book at the station or by phone with a ticketing agency in your home country. For Dubrovnik, take a bus from Split. There are buses every hour or even every half hour, run by several companies. Journey time between 3h45 and 4h35, fare around €13-€17. Buy a ticket at the bus station in Split. Step 1, take the excellent overnight Croatian sleeper train Lisinski leaving Munich Hbf at 23:20 and arriving Zagreb at 08:35. 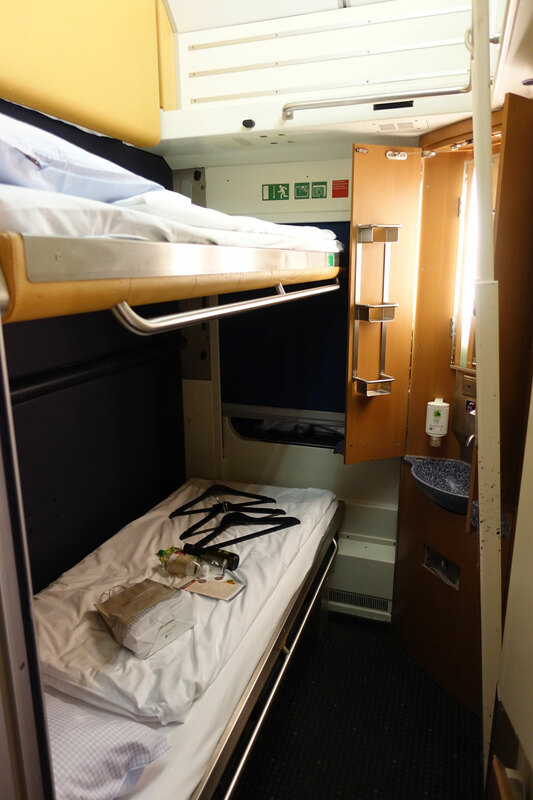 It has a smart air-conditioned Croatian sleeping-car with 1, 2 & 3 bed compartments, and an air-conditioned Croatian couchette car with 4 & 6 berth compartments, see the photos & sleeper video here. Fares start at €49 with couchette, €89 with a bed in a 2-bed sleeper or €129 in a single-bed sleeper all to yourself. You can book this sleeper at the German Railways website www.bahn.de and print your own ticket. 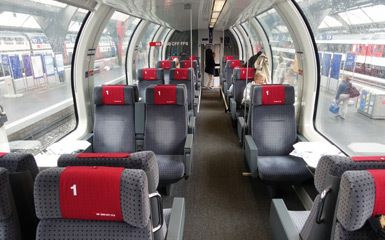 Or you can try www.trainline.eu, which links to the Austrian Railways system and also offers print your own tickets. Step 2, take the comfortable air-conditioned train leaving Zagreb at 11:03 and arriving Belgrade Centar station at 17:42. Fare around around €30 if bought at the station. It cannot be booked online from the operators, so just buy when you reach Zagreb, it's not a problem. Step 3, if you're heading to Sofia, spend the night in Belgrade, I recommend the historic Hotel Moskva. 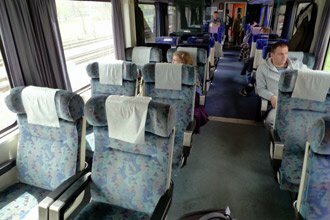 Then travel from Belgrade to Sofia by daytime train, see the Belgrade to Sofia page for full details and photos. 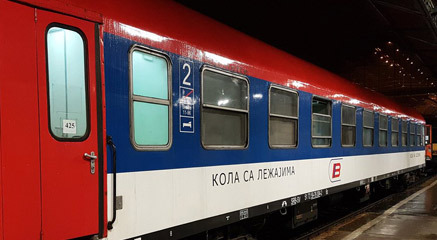 From 14 June to 16 September 2019, there's a direct train called the Balkan which leaves Belgrade Topcider station at 09:12 arriving Sofia Central Station at 20:30. 2nd class only, bring your own picnic and bottle of wine as there's no catering. At other times of year you leave Belgrade Centar station at 06:10, change at Nis & Dimitrovgrad arriving Sofia at 19:00. Buy this ticket at the station for €20.60, there are always places available, even on the day. It cannot be booked online, and there's no need. Step 1, take the excellent Hungarian sleeper train Kalman Imre leaving Munich Hbf at 23:20 and arriving at Budapest Keleti at 09:19. 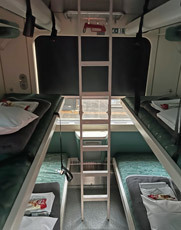 You'll find photos showing what the Kalman Imre's Hungarian couchettes and sleeping-cars are like on the London to Budapest page, also watch the Hungarian sleeping-car video here. Spend a morning exploring Budapest. Munich to Budapest starts at €49 with a couchette in 6-berth, €59 with a couchette in 4-berth, €79 with a bed in a 2-bed sleeper or €139 in a single bed sleeper. You can book this train online at www.bahn.de, in the search results just look for the option with 0 changes marked EN. You print your own ticket. Alternatively, check prices and buy at www.trainline.eu also with print-your-own tickets. Step 2, take the Budapest to Belgrade EuroCity train Avala, leaving Budapest Keleti at 11:57 and arriving Belgrade Centar station at 20:42. Take your own picnic and beer along as there's no restaurant car. The fare from Budapest to Belgrade is just €15 if you book at the Hungarian railways website www.mavcsoport.hu, clicking 'EN' for English top left. This is a permanently-available special offer. You collect your tickets from the yellow internet ticket machines at Budapest Keleti station. There is no equivalent 1st class offer, so just stick with 2nd class on this train, all 1st class gets you is 2" more legroom in any case. 2nd class is absolutely fine. IMPORTANT UPDATE: From 1 February 2019 until December a section of the Budapest-Belgrade route is being rebuilt for 200km/h operation which will eventually reduce journey time to 3½ hours. Just one train per day will link Budapest with Belgrade during this period, the Ivo Andric leaving Budapest Keleti at 11:57 arriving Belgrade Centar at 20:42, 2nd class only. You may be asked to switch trains in Kelebia & Novi Sad. Important: See further details & read latest updates about this engineering work. Step 3, if you're heading to Sofia, spend the night in Belgrade - I recommend the historic Hotel Moskva at the end of Belgrade's main pedestrianised shopping street. Then travel from Belgrade to Sofia by daytime train, see the Belgrade to Sofia page for full details and photos. From 14 June to 16 September 2019, there's a direct train called the Balkan which leaves Belgrade Topcider station at 09:12 arriving Sofia Central Station at 20:30. 2nd class only, bring your own picnic and bottle of wine as there's no catering. At other times of year you leave Belgrade Centar station at 06:10, change at Nis & Dimitrovgrad arriving Sofia at 19:00. Buy this ticket at the station for €20.60, there are always places available, even on the day. It cannot be booked online, and there's no need. Step 1, travel from Munich to Budapest by railjet train, leaving Munich Hbf at 13:30 arriving Budapest Keleti at 20:19. Railjet trains have a bistro-restaurant car, free WiFi & power sockets at all seats, see the railjet photos, tips & information here. By all means book an earlier train and have a pleasant evening in Budapest, trains leave Munich every 2 hours from 07:25 onwards. Fares start at €39.90 in 2nd class, €69.90 in 1st class or €84.90 in business class. Book this train at either www.bahn.de or www.trainline.eu, in the search results just look for the option with 0 changes marked RJX. You print your own ticket. Step 2, take the Budapest to Belgrade overnight train Beograd, leaving Budapest Keleti at 22:15 arriving Belgrade Centar station at 06:43. 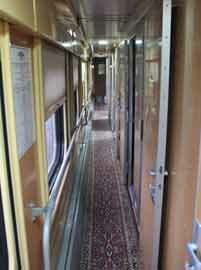 The train has an elderly Serbian couchette car with 4 & 6 berth compartments, although at least one refurbished car is now in service, see the photos below. 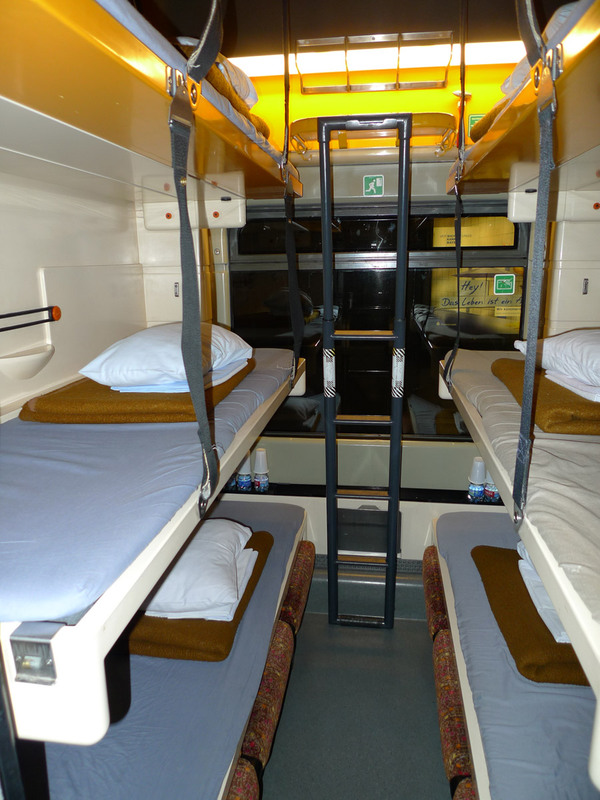 There is now no sleeping-car as Serbian Railways is short of serviceable sleepers. The fare is just €15 (a permanently-available unlimited special offer) plus €8 supplement for a couchette in 6-berth or €10 for a couchette in 4-berth. I recommend 4-berth as there is much more space per passenger. A clean sheet, pillow and blanket are provided for each berth. Unlike the seats cars which have no lock on the compartment doors, the couchette compartments have both a normal lock and security chain so you'll be both safe and snug. You can easily buy tickets online at Hungarian Railways www.mavcsoport.hu with ticket collection in Budapest. Booking opens 60 days ahead. See tips for using mavcsoport.hu & how to collect your tickets from the yellow ticket machines. IMPORTANT UPDATE: From 1 February 2019 until December a section of the Budapest-Belgrade route is being rebuilt for 200km/h operation which will eventually reduce journey time to 3½ hours. Just one train per day will link Budapest with Belgrade during this period, the Ivo Andric leaving Budapest Keleti at 11:57 arriving Belgrade Centar at 20:42, 2nd class only. You may be asked to switch trains in Kelebia & Novi Sad. 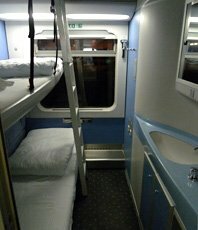 The Budapest-Belgrade sleeper train is cancelled. Important: See further details & read latest updates about this engineering work. Step 3, if you're heading to Sofia, a same-day connection is possible from 14 June to 16 September 2019. Take a taxi or tram number 3 to Belgrade Topcider station, a direct train called the Balkan leaves Belgrade Topcider at 09:12 arriving Sofia Central Station at 20:30. 2nd class only, bring your own picnic and bottle of wine as there's no catering. At other times of year you'll need to spend a day & night in Belgrade, then leave Belgrade Centar station at 06:10, change at Nis & Dimitrovgrad arriving Sofia at 19:00. Buy this ticket at the station for €20.60, there are always places available, even on the day. It cannot be booked online, and there's no need. 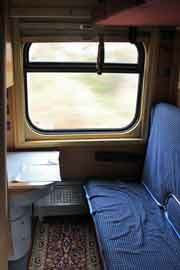 The Serbian couchette car from Budapest to Belgrade. At least one refurbished car like this is now in service. Courtesy of @OO$WAG..
Option 1, via Warsaw 3 times per week, reduced from daily in June 2017. Travel from Munich to Warsaw on day 1 as shown above, and stay overnight. Spend the next day exploring Warsaw. 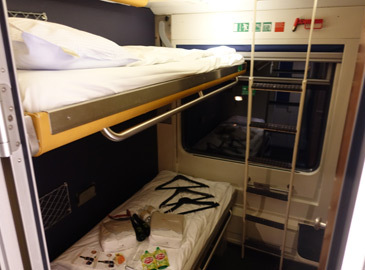 Travel from Warsaw to Moscow on the sleeper train Polonez leaving Warsaw Centralna at 16:05 on Tuesdays, Thursdays & Saturdays and arriving Moscow Belorussky station next day at 12:11 (late March to late October) or 13:11 (late October to late March). The Polonez uses Russian air-conditioned sleeping-cars, pictured below, with compartments which can be used as 1st class 2-berth or 2nd class 4-berth, there are a shower & toilets at the end of the corridor. 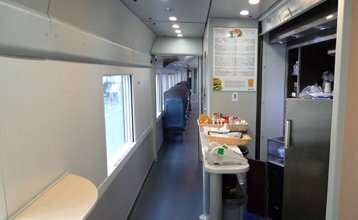 See panorama photo inside one of the new Russian sleepers.. This train passes through Belarus, so you'll need a Belarus transit visa. 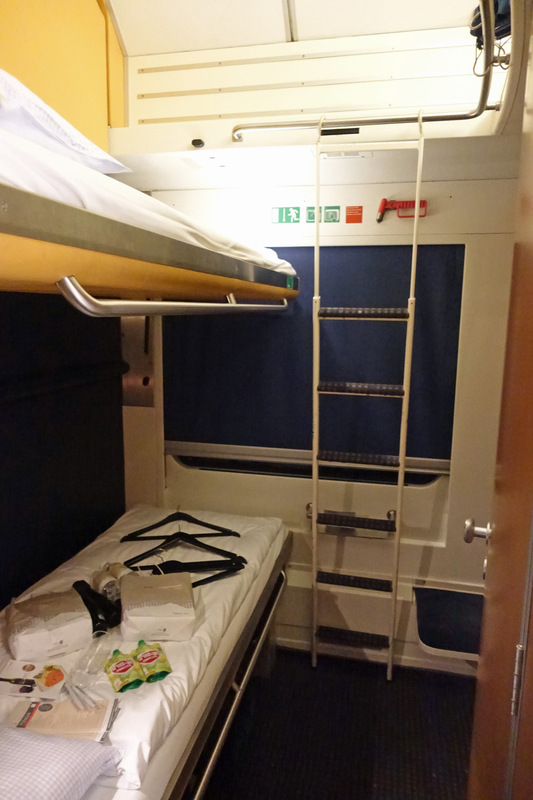 Fare around €111 in a 2-berth sleeper. Next morning, as the train passes through the small station of Borodino, look out for the plaques on the station building marked '1812' and '1942'... Map of Moscow showing Byelorusski station. 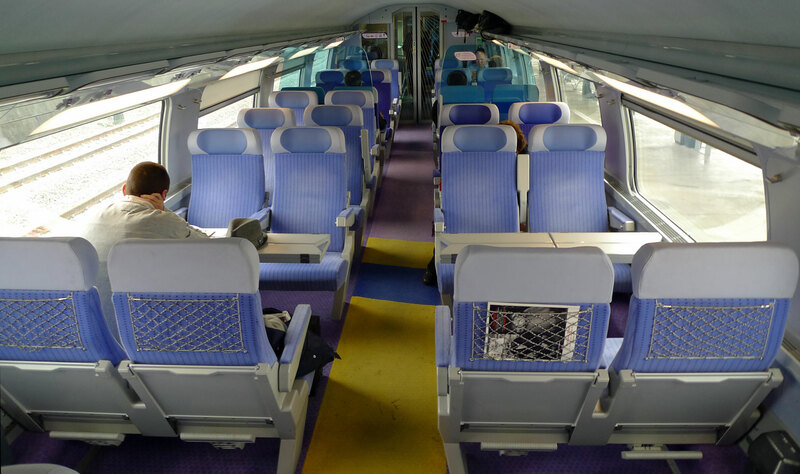 You can try booking the Polonez online at en.oui.sncf, this may or may not work for this train, it has in the past. Alternatively, anyone can contact highly-recommended Polish train ticketing agency www.polrail.com (their booking system is at http://booking.polrail.com), who can arrange train tickets for international trains starting in Poland with tickets collected in Warsaw or (at extra charge) shipped to any address worldwide. Step 1, travel from Munich to Berlin from €29.90 in as little as 3h58. For example, the 13:47 from Munich Hbf arrives Berlin Hbf at 18:25, but by all means take an earlier train and have dinner in Berlin. Book this at www.bahn.de and print your own ticket. Transfer by frequent S-Bahn train from Berlin Hbf to Berlin Ostbahnhof. Step 2, travel from Berlin to Moscow by new direct Russian sleeper train, leaving Berlin Ostbahnhof at 19:24 on Mondays & Saturdays, arriving at Moscow's Belorussky station next day at either 19:55 (late March to late October) or 20:55 (late October to late March). This train is an articulated Spanish-built Talgo train branded Strizh (swift). 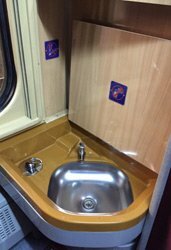 It has ordinary seats and sleeping-cars with 2nd class 4-berth compartments, 1st class 1 or 2 berth compartments with washbasin and deluxe 1 or 2 berth compartments with en suite shower & toilet. There's also a restaurant & bistro car. 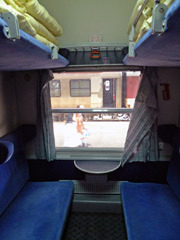 See photo of 2-berth sleeper on this train . Step 1, travel from Munich to Vienna by comfortable railjet train, from €29.90 booked at German Railways www.bahn.de, you print your own ticket. For example, the 11:30 from Munich Hbf arrives Vienna Hbf at 15:30, but I'd take an earlier train for more time in Vienna. 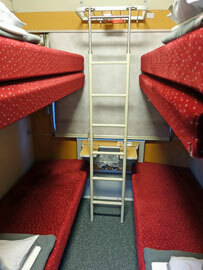 Step 2, travel from Vienna to Kiev by direct Ukrainian sleeping-car. leaving Vienna Hbf at 16:42 every day and arriving next day at Kiev at 16:14. Introduced in December 2017, this train has a Ukrainian sleeping-car with comfortable 1, 2 & 3 berth compartments with washbasin. 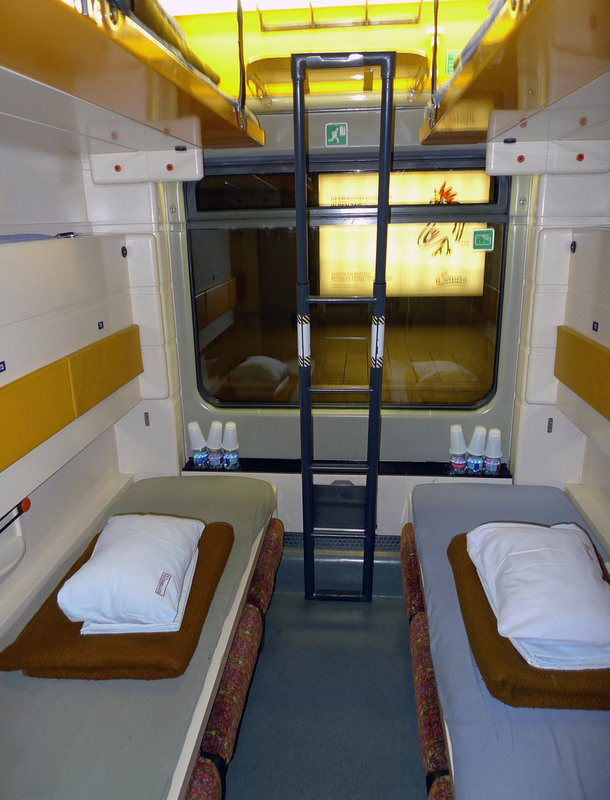 Vienna to Kiev costs around €138 in a 3-berth sleeper €149 in a 2-berth sleeper, or €241 in a single-berth sleeper. 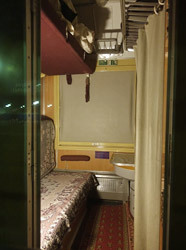 Step 3, take one of the various Kiev to Moscow sleeper trains, for example train 6 leaves Kiev at 19:36 arriving Moscow Kievskaya station around 10:09. The fare is around €92 with a bed in 4-berth kupé or €180 with a bed in a 2-berth spalny vagon. You can ask www.polrail.com to book this for you too, or you can book tickets from Kiev to Moscow at the Ukrainian Railways site https://booking.uz.gov.ua/en/ booking from Kyiv to Moskva Kievskaya. You collect tickets at the station in Kiev. Feedback appreciated! Step 1, travel from Munich to Vienna by comfortable railjet train, from €29.90 booked at German Railways www.bahn.de, you print your own ticket. For example, the 11:30 from Munich Hbf arrives Vienna Hbf at 15:30, but I'd take an earlier train and have more time in Vienna. 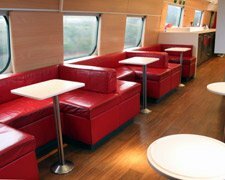 The railjets have a bistro-restaurant car with draught beer on tap, power sockets at all seats & free WiFi. 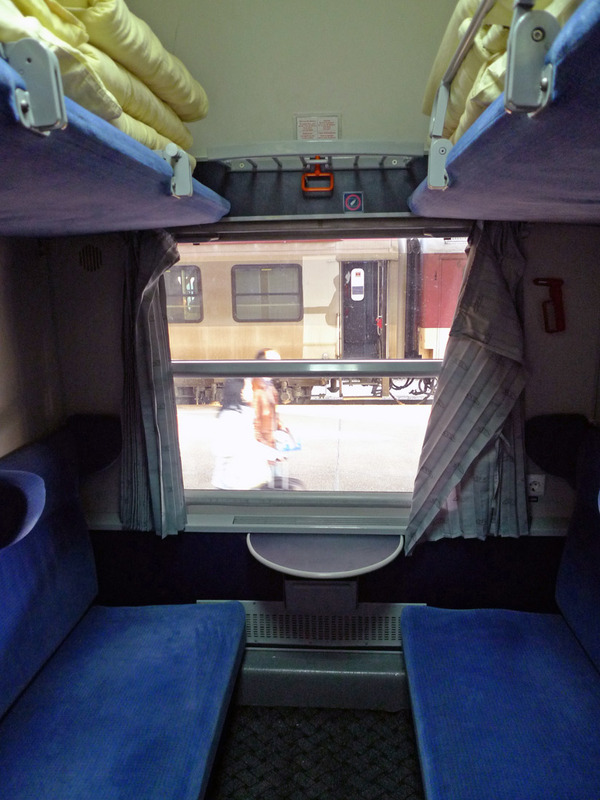 Step 2, travel from Vienna to Lviv or Kiev by comfortable direct Ukrainian sleeping-car. leaving Vienna Hbf at 16:42 every day and arriving next day at Lviv at 09:10 & Kiev at 16:14. 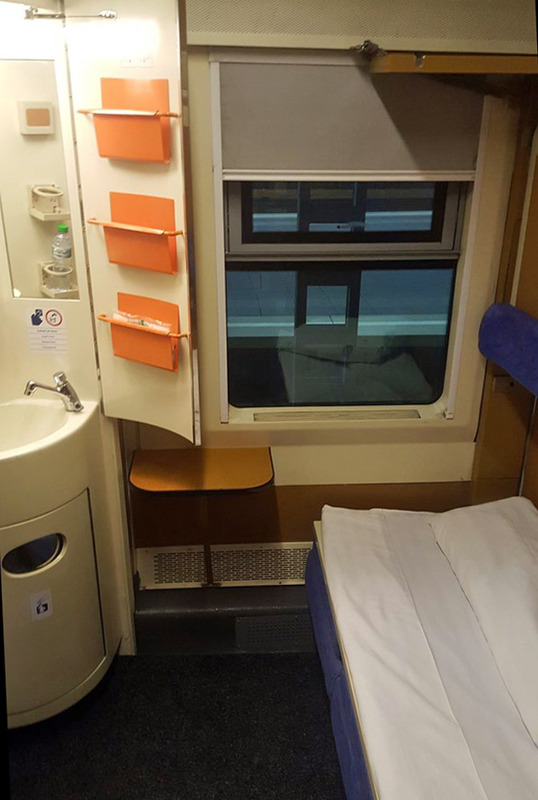 Introduced in December 2017, this train has a Ukrainian sleeping-car with comfortable 1, 2 & 3 berth compartments with washbasin, see the photos below. 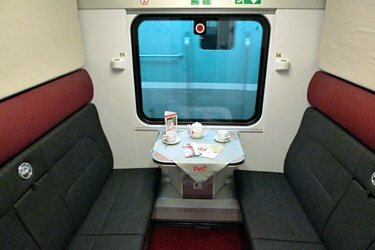 An air-conditioned Slovakian restaurant car operates from Vienna to Zahony, on the border with Ukraine reached around midnight. At Chop on the other side of the border the through sleeping-car is jacked up to have its wheelsets changed from European standard gauge (4'8½") to Russian gauge used in Ukraine (5'). 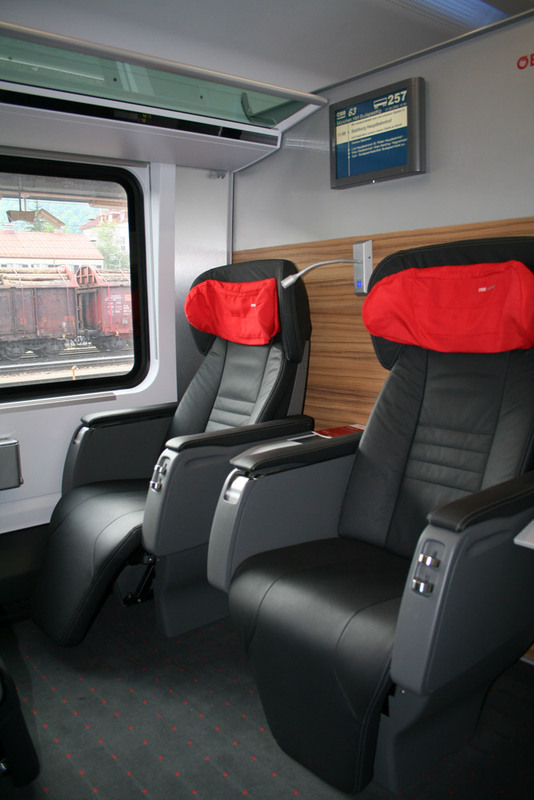 Book the train from Vienna to Lviv or Kiev online at the Austrian Railways website www.oebb.at. This will only book one-way or round trip starting in Vienna because tickets need to be collected from an ÖBB station in Austria. They cannot be collected in Ukraine. Booking this way you pay no fee or mark-up, just the official fare. The sleeper has become popular, it can sell out. 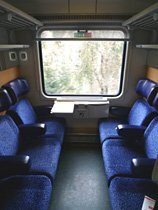 If you have any problems or want a one-way ticket starting in Ukraine, you can also book the Vienna-Kiev train via reliable agency www.polrail.com, with tickets posted or couriered to you for a small fee. Polrail are based in Poland so charge in zlotys, but as they have access to Ukrainian ticketing system they are good for booking this train. 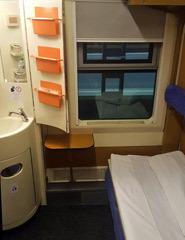 Vienna to Kiev costs €80.50 in a 3-berth sleeper, €90.50 in a 2-berth sleeper or €152.90 in a single sleeper. Vienna to Lviv costs €62.10 in a 3-berth sleeper, €70.10 in a 2-berth sleeper or €119.30 in a single sleeper. 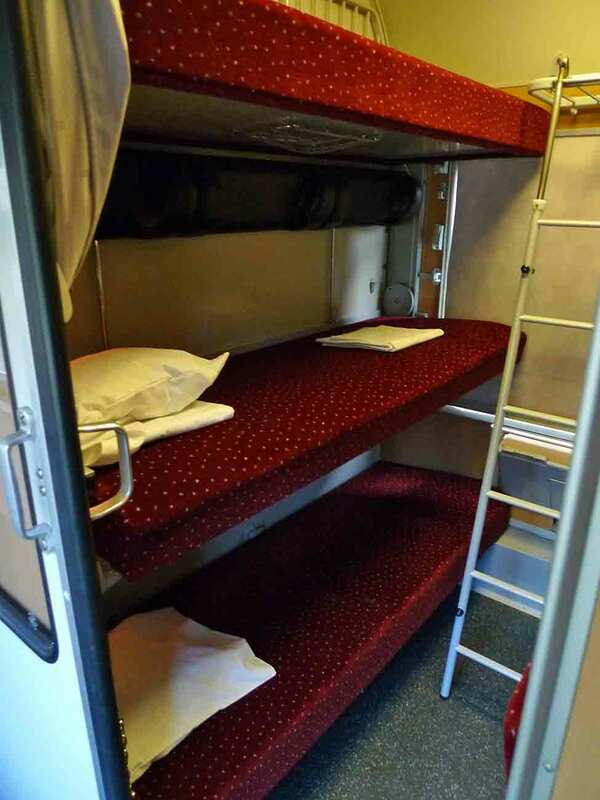 Vienna to Lviv costs around €120 in a 3-berth sleeper €129 in a 2-berth sleeper, or €207 in a single-berth sleeper. 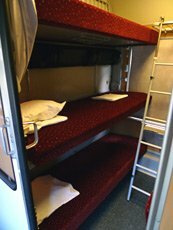 Booked at the station in Ukraine, Kiev to Vienna costs around €80, Lviv to Vienna around €60, in both cases with a bed in a 3-bed sleeper. Boarding the Vienna to Kiev sleeping-car at Vienna Hbf. Photo courtesy of Helmut Uttenthaler. The Vienna-Kiev sleeper about to leave Vienna Hbf... Courtesy of Helmut Uttenthaler. The sleeper corridor. Courtesy Helmut Uttenthaler. 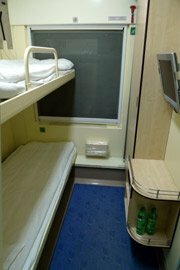 1, 2 or 3 bed sleeper compartment. The Vienna-Kiev sleeping-car at Kiev Pass. Photos courtesy of Helmut Uttenthaler. Step 1, travel from Munich to Warsaw as shown above, either by daytime trains and staying overnight or by railjet and sleeper train. Either way, you then have a day to explore Warsaw. 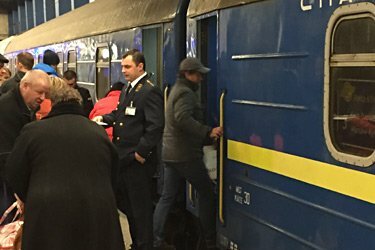 Step 2, an overnight train called the Kiev Express leaves Warsaw Centralna at 17:09 and arrives in Kiev at 11:05 next day. This train has comfortable Ukrainian 1, 2 & 3 bed sleepers with washbasin. There's no restaurant car, so take a picnic and perhaps some wine or beer. Munich Hbf depart 07:19, change at Lübeck, arrive Copenhagen at 18:26. Munich Hbf depart 11:20, change at Hamburg Hbf, arrive Copenhagen at 22:26. Book from Munich to Copenhagen as one transaction at www.bahn.de. Total journey around 11h05, so a long day, but take a bottle of wine and a good book and put your feet up. 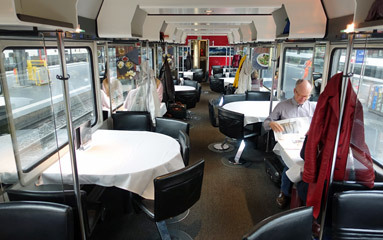 The trains have power sockets at all seats and the ICE trains have a bistro-restaurant car. The Hamburg-Copenhagen EuroCity trains get shunted onto a train ferry for a 50-minute crossing from Puttgarden to Rødby, one of the few places in the world that trains go onto ferries and a fascinating experience in its own right. You need to leave the train and go up into the ferry's passenger accommodation (and perhaps get some sea air on deck) while the ferry is at sea, returning to the train before it's shunted off the ferry at the other end. You can leave your luggage on the train. See photos, tips & information for the Hamburg to Copenhagen journey. Step 1, take the overnight Nightjet sleeper train from Munich to Hamburg leaving Munich Hbf at 22:52 and arriving Hamburg Hbf at 08:44. Step 2, take the 09:28 EuroCity train from Hamburg to Copenhagen arriving at 14:26. Fares start at €29.90 in 2nd class or €59.90 in 1st class. The Hamburg-Copenhagen trains get shunted onto a train ferry for a 50-minute crossing from Puttgarden to Rødby, a fascinating experience in its own right. You need to leave the train and go up into the ferry's passenger accommodation (and perhaps get some sea air on deck) while the ferry is at sea, returning to the train before it's shunted off the ferry at the other end. You can leave your luggage on the train. see photos, tips & information for the Hamburg to Copenhagen journey. You can book this as one transaction at www.bahn.de, simply run an enquiry from Munich to Copenhagen with departure time set to 22:00, and look for the option with 1 change marked 'EN, ICE' in the search results. You print your own ticket. If you have any problems, book each train separately. A Danish IC3 train at Copenhagen station. IC3s now work all the Hamburg-Copenhagen trains. Take the overnight Nightjet sleeper train leaving Munich Hbf at 22:52 and arriving Hamburg Hbf 08:44, then the comfortable 09:28 EuroCity train from Hamburg Hbf to Copenhagen arriving at 14:26, then an onward X2000 train from Copenhagen to Stockholm or Öresund Link train from Copenhagen to Malmö or Gothenburg. The 16:23 X2000 train from Copenhagen arrives Stockholm Central at 21:37. The Hamburg-Copenhagen EuroCity train travels via the Puttgarden-Rødby train ferry, one of the few places left in the world where trains go onto a ferry, see photos, tips & information for the Hamburg to Copenhagen journey. 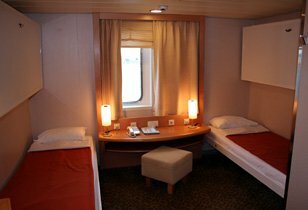 Fares for the sleeper start at €59 in 6-berth couchettes, €69 in 4-berth couchettes, €99 in a 2-bed sleeper or €139 in a single-bed sleeper. Deluxe sleepers with en suite toilet & shower are also available. A light breakfast is included in sleepers & couchettes, served in your compartment. 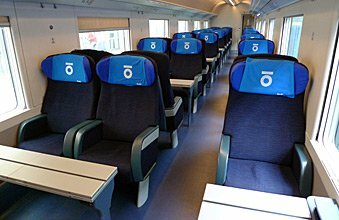 Hamburg to Sweden starts at €39 in 2nd class or €69 in 1st class. 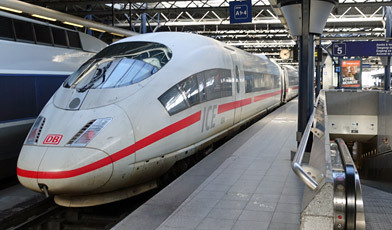 You can book this as one transaction at www.bahn.de, simply run an enquiry from Munich to Stockholm, Malmö or Goteborg Central with departure time set to 22:00, and look for the option with 2 change marked 'EN, ICE, X2' or 'EN, ICE, R' in the search results. If you have any problems, split the booking into Munich-Hamburg and Hamburg-Sweden. 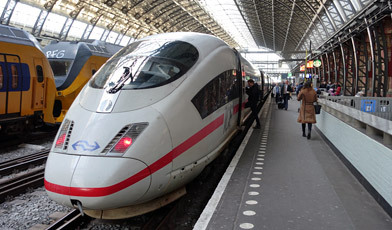 Day 1, travel from Munich to Hamburg by luxurious direct ICE train in as little as 5h49. There are regular departures right up until early evening. Day 2, travel from Hamburg to Copenhagen on the 09:28 EuroCity train arriving Copenhagen 14:26. The Hamburg to Copenhagen trains go onto a ferry between Puttgarden & Rødby, one of the few places in Europe where trains still get shunted onto ferries. 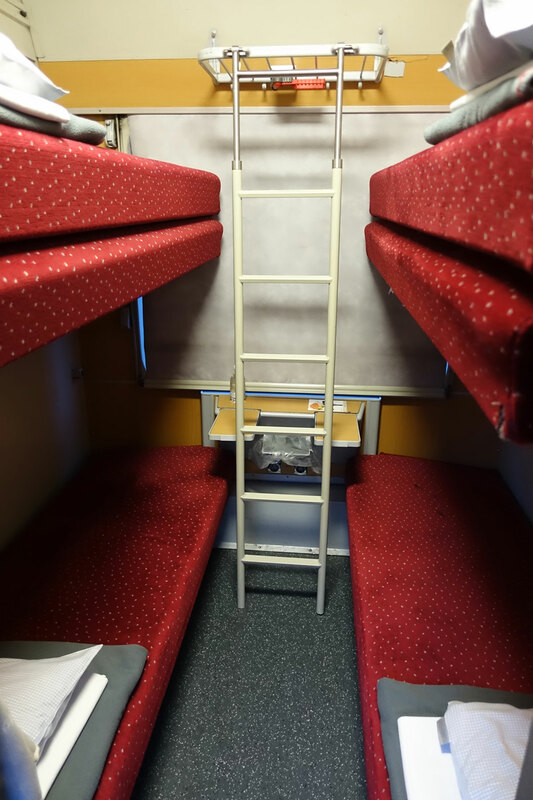 It's an interesting experience in its own right - you must leave the train and go upstairs into the ship's passenger accommodation during the 50-minute crossing, but you can leave your luggage on the train. For Stockholm, now take a 125mph X2000 train from Copenhagen to Stockholm. If you left Hamburg at 09:28 you'd arrive Stockholm at 21:40. 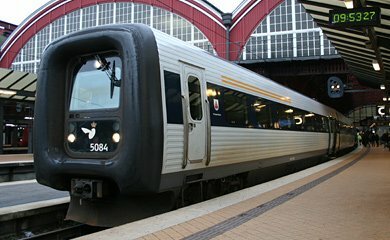 For Malmö or Gothenburg, Öresund Link trains run hourly from Copenhagen to Gothenburg in 3h48 and every half hour or better from Copenhagen to Malmö in 34 minutes. For Oslo & Norway, travel as far as Copenhagen, then take the overnight cruise ferry with bars, restaurants and en suite cabins to Oslo, she sails from Copenhagen daily around 16:30, arriving in Oslo around 09:45, see www.dfds.co.uk for times, prices & online tickets. If you want to keep things simple, you can book the straightforward way. Go to www.bahn.de and book from Munich to Hamburg on day 1. Then use www.bahn.de again to book from Hamburg to Malmö, Gothenburg or Stockholm on day 2. Go to www.bahn.de and enter Munich to Stockholm (or Malmo or Goteborg Central). Select a mid-afternoon departure time, click Add intermediate stops, enter Hamburg in the via box and a time of say 12:00 in the hh:mm stopover box. This will give you a 12-hour stopover in Hamburg. Click here for a link to bahn.de which I've set up for you. Adjust the overnight stopover time as necessary to get the trains you want. If you're going to Norway, add a connecting Gothenburg to Oslo S ticket using either www.nsb.no or www.sj.se. Day 1, travel from Munich to Copenhagen by luxurious ICE & EuroCity train with one easy change in Hamburg. You'll usually find departures from Munich at 07:19 arriving Copenhagen at 18:26, or at 11:20 arriving Copenhagen at 22:26. Take a bottle of wine and a good book and put your feet up! The Hamburg to Copenhagen EuroCity trains go onto a ferry between Puttgarden & Rødby, one of the few places in Europe where trains still get shunted onto ships. 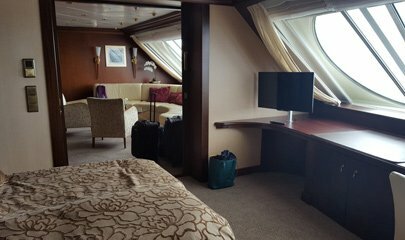 It's an interesting experience in its own right - you must leave the train and go upstairs into the ship's passenger accommodation during the 50-minute crossing, but can leave you luggage on the train. Stay overnight in Copenhagen... Hotels in Copenhagen near the station with good reviews: Nimb Hotel (5-star luxe), Radisson Blu Royal Hotel (5-star), Axel Guldsmeden (4-star), Andersen Bou]tique Hotel, First Hotel Mayfair (3-star), Hotel Ansgar (3-star), City Hotel Nebo (2-star). Day 2, if travelling to Stockholm: Travel from Copenhagen to Stockholm by 125mph X2000 train in around 5h11, there are regular departures. For example there's usually one around 08:23 arriving Stockholm Central 13:37, or have a leisurely breakfast and take the 12:23 arriving 17:37. Day 2, if travelling to Gothenburg or Oslo: Travel from Copenhagen to Gothenburg (= Goteborg Central) on any of the hourly Öresund trains, journey time 3h48. For Oslo, take the 08:27, change at Gothenburg and arrive Oslo Sentral (= Oslo S) at 16:52. How much does it cost? You can buy German Railways' sparpreis tickets from Munich to Malmö, Gothenburg or Stockholm for as little as €39.90. The fare varies, so book early for the best prices. 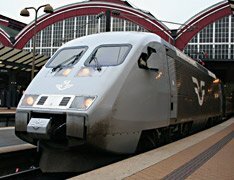 If travelling to Stockholm or Gothenburg, go to www.bahn.de and book from Munich to Stockholm or Goteborg Central with a morning departure selected, but to see these cheap fares you must click Add intermediate stops, enter Copenhagen in the via box and a time of (say) 12:00 in the hh:mm stopover box. This will give you a 12-hour stopover in Copenhagen. Click here for a link to bahn.de which I've set up for you. Adjust the overnight stopover time as necessary to get the trains you want. If travelling to Oslo, go to www.bahn.de and book from Munich to Gothenburg with a morning departure selected, but to see the cheap fares you must click Add intermediate stops enter Copenhagen in the via box and a time of say 12:00 in the hh:mm stopover box. Click here for a link to bahn.de which I've set up for you. Adjust the overnight stopover time as necessary to get the trains you want. Now add a connecting Gothenburg to Oslo S ticket using either www.nsb.no or www.sj.se. A Danish IC3 train at Copenhagen station... Hamburg-Copenhagen trains are now EuroCity trains worked by Danish IC3 units like the one above. A 125 mph X2000 train from Copenhagen to Stockholm. Self-service buffet car on the X2000 to Stockholm. Step 1, travel from Munich to Kiel on any suitable train from €29.90. Step 2, sail from Kiel to Oslo by luxurious overnight Color Line ferry, check times & buy tickets at the seat61 Ferry Shop or www.colorline.com. For Finland, you'll find ferries the best bet from either Travemünde in Germany to Helsinki, see www.finnlines.com. Then use www.bahn.de to find connecting trains from Munich to Travemünde from €39.90. The best and most comfortable option is to pick up a ferry in Bari. The whole scenic and relaxing journey from Munich to Athens will take around 2 nights & 3 days, depending how the connections work out on your particular date. 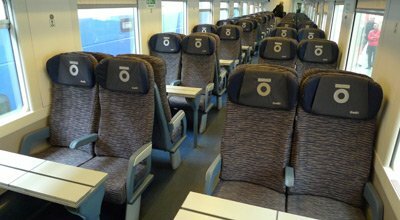 Day 1, travel from Munich Hbf to Verona Porta Nuova from €39.90 through the scenic Brenner Pass with a restaurant car for lunch & dinner. There are various departures, journey time 5h18, you can leave in the afternoon. Check times, prices & buy online with German Railways at www.bahn.de. Day 2, take an early morning train around 07:50 from Verona Porta Nuova to Bari Centrale from €29.90 booked at either www.italiarail.com or www.trenitalia.com. Make sure you allow at least 3 hours between between train arrival and ferry departure in Bari. 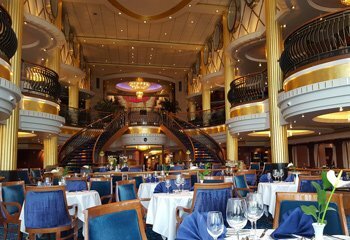 Day 2, then sail across the Adriatic from Bari to Corfu, Igoumenitsa or Patras in Greece aboard a luxurious cruise ferry booked at www.superfast.com. She normally sails daily except Sundays at 19:30 arriving 13:00 next day (day 3). 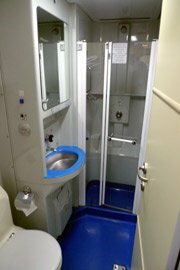 The ferry has bars, restaurants, sun decks, lunges, reclining seats and cabins, some with en suite shower & toilet. It's a lovely crossing, see the photos below. Day 3, Patras is a few hours bus ride from Athens. If you hunt for it, there's a bus/train combined timetable from Patras to Athens on www.trainose.gr but it's pretty hard to find. The Bari to Athens part of this journey is covered in more detail on the London to Greece page, just disregard the London to Milan part of the recommended journey! You can also travel overland by train from Munich to Athens via Belgrade & Thessaloniki. It'll take 3 nights, with the romance and adventure of an epic train ride through the Balkans. In Munich you pick up the London-Munich-Belgrade-Thessaloniki-Athens route explained in detail on the London to Greece page. Just disregard the London-Munich part. You can pick up the London-Istanbul route suggested on the London to Turkey page in Munich. See the London to Turkey page for details of how to book as far as Bucharest online. The last leg needs to be booked by phone at when you get to Bucharest.